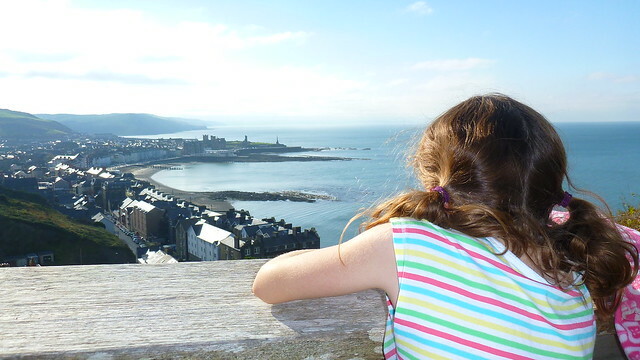 I love my kids, bless ’em, but there comes a time in every doting mum and dads life where they need some quality time away from their constant maintenance. Born over a few beers in Little Langdale a few years ago the rather weakly punned “Adults Only” weekend has been a great hit for our little band of University friends the past few autumns. 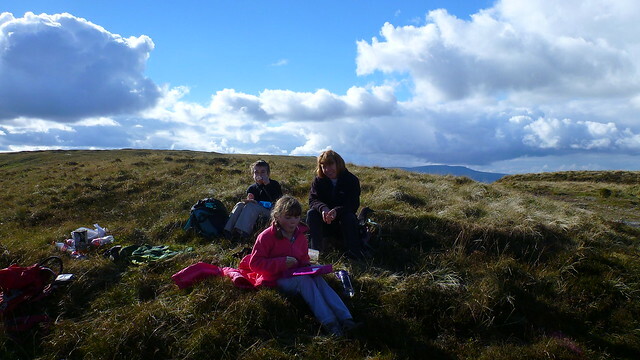 A chance for everyone to relax and enjoy a decent walk without spending the whole day encouraging the kids to keep going. 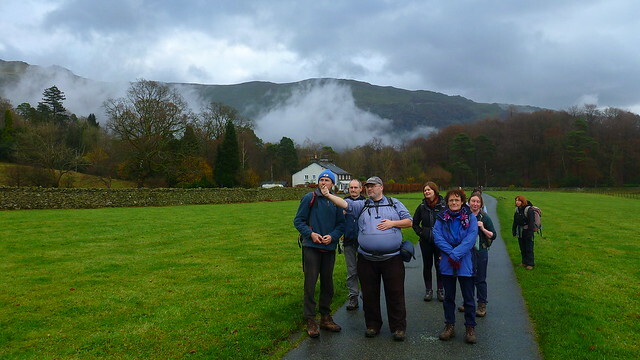 We returned to the Travellers Inn at Grasmere, a convivial Lakeland pub with nice rooms and great food. I wasn’t encouraged by the forecast but news reached us via ED that Saturday was set to be stonking and that was before EWO had arrived. The old apprentice was right though and the day looked promising as we all faffed about in the car park, which is what forty-something’s do I guess. 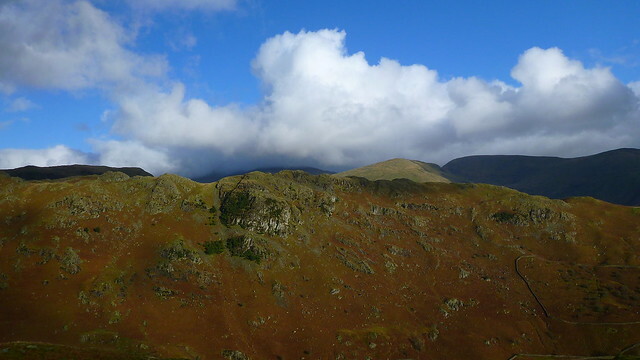 To the east Fairfield’s ridges towered above us swathed in cloud but to the west the lower rocky hills above Easdale looked clear and bathed in sunlight under a patchy blue sky. From the first few strides across the fields it was clear that wet feet was to be the order of day. 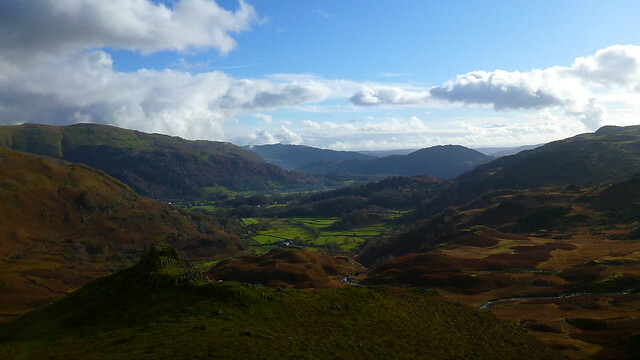 A landscape can only soak up so much water and the Lake District was clearly full. 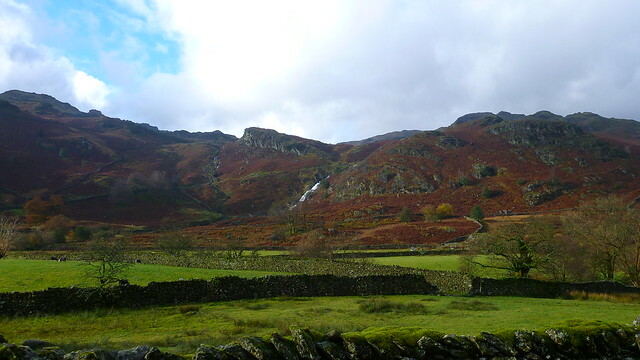 Every field, path and hollow was smeared in mud and every hollow higher up was oozing bog. Conditions that mandated boots and gaiters so I wore trail shoes and spent pretty much the whole day with light unencumbered, but wet and cold feet especially at the latter end of the day but more of that later. We paused as ever at the stepping-stones to see if someone would do the decent thing and fall in but despite noisy encouragement even TBF declined to do a crowd pleaser. 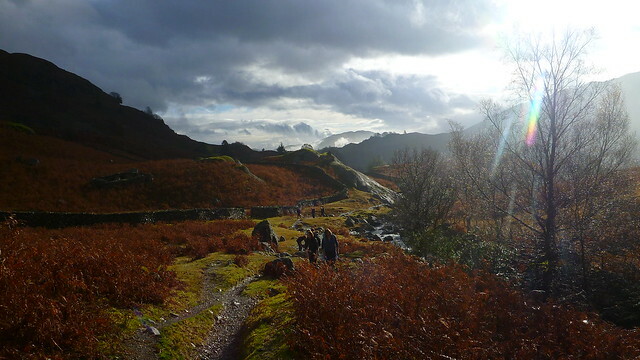 Frustrated and disappointed we headed off into Easedale as the skies cleared revealing large patches of blue sky squeezed between some rather darker clouds. The light was just fantastic and I gave thanks to whatever greater power was dealing out my good fortune with another spellbinding autumn day amongst a truly appalling spell of weather. 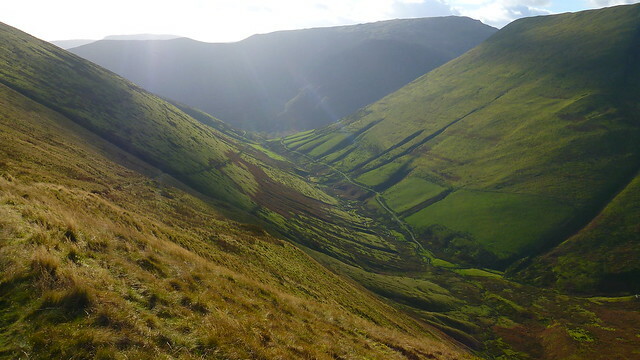 Sourmilk Ghyll across the valley was looking every bit its name streaking the hillside. 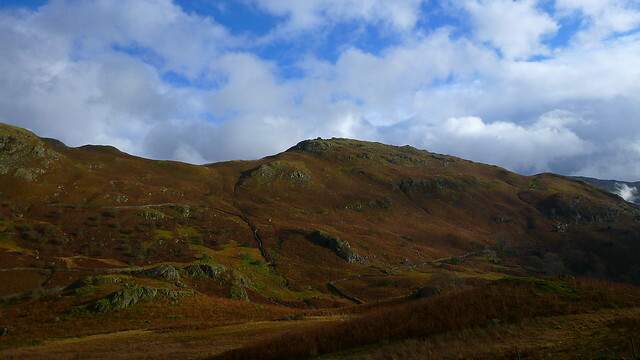 We took to the path up Far Easedale and turned to head up the knobbly ridge towards Tarn Crag. 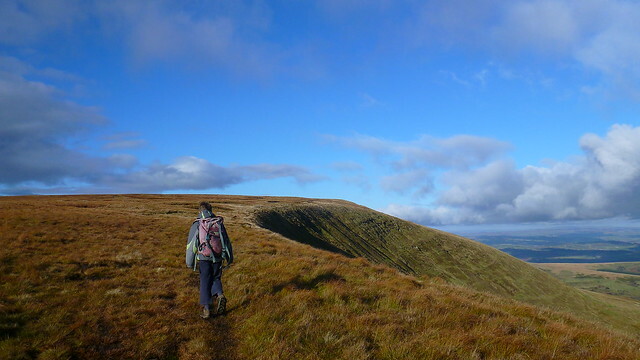 The path was fine and quiet and draws you up without much effort towards its summit. 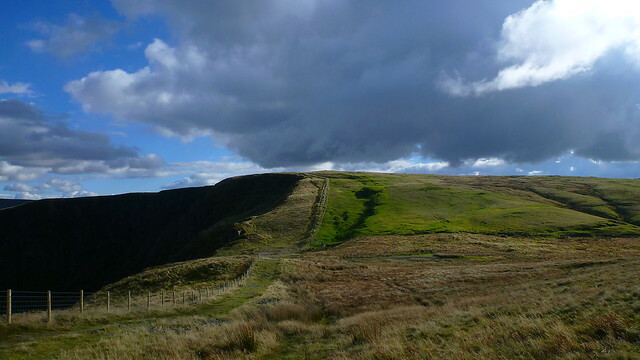 From below it looks dramatic but up top its just another knoll that scatter this upland region. 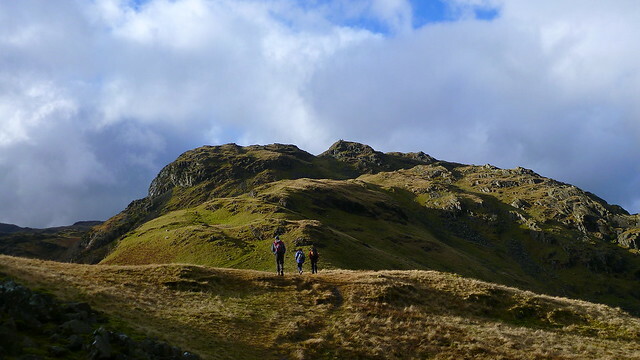 Most of the tops round there are all around 2,000 feet but the terrain is complex and gives it a tougher feel than its height and close proximity to Grasmere would have you believe. 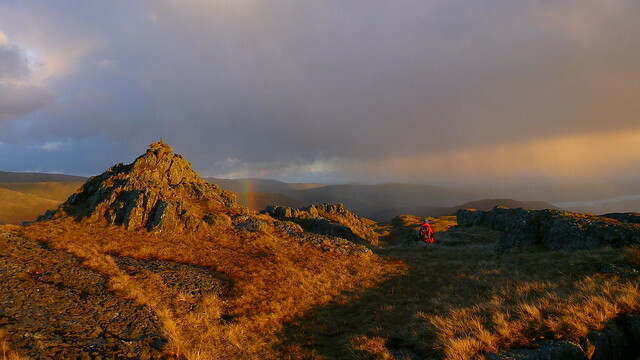 The views across Helm Crag (complete with Rainbow) to Fairfield were just staggering. 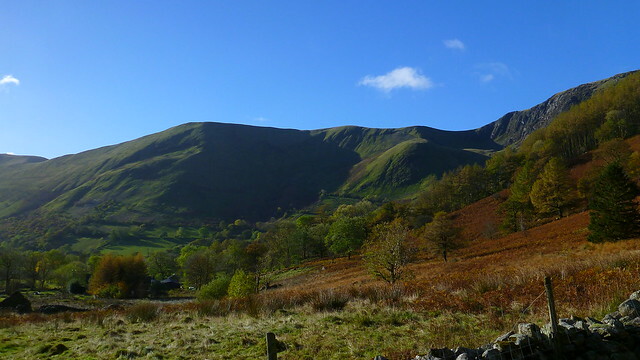 The clarity of the light combined with the brown/blue contrast between hillside and sky compelled a rest. So we did. One our party had to return home the same day so we had a longish stop before she had to head down. As always a time for some oft-repeated stories and general mickey-taking for all. 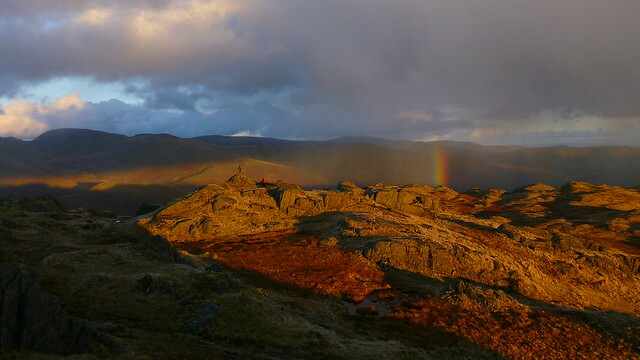 From Tarn crag the way became much rougher and wetter, hard though that was to imagine. 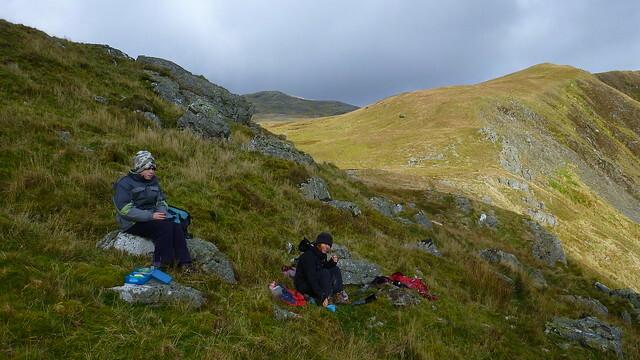 After a brief and light hailstorm we stopped properly for lunch on the slopes below Codale Head. 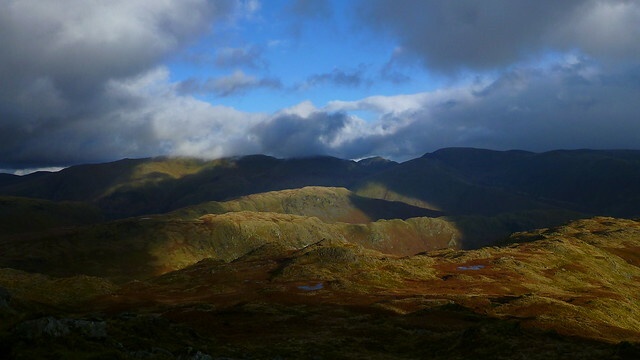 A dark and brooding spot but the views east kept us happy. 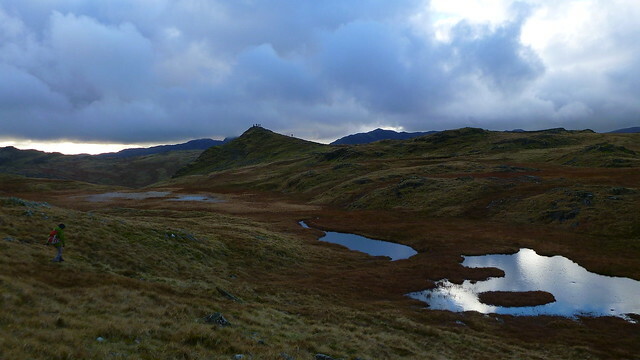 On to the high point of the day Sergeant Man, a prominent rocky knoll becalmed in a sea of boggy tarns. It was exceptionally wet up here, a challenge to pick your way dryshod. For the first time in the day we saw some crowds. There were are least 20 people milling about near the top and it was suddenly, shockingly and blisteringly cold. The cold front was upon us and the warm air of the earlier part of the day and had turned decidedly wintry. 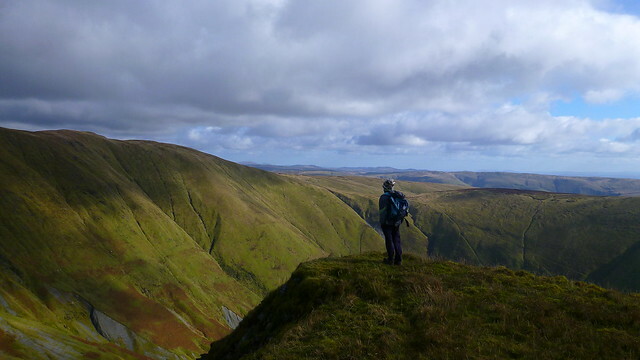 We had planned to take in High Raise but its a bland and boggy top and doesn’t possess the interest and intrigue of the lower hills. 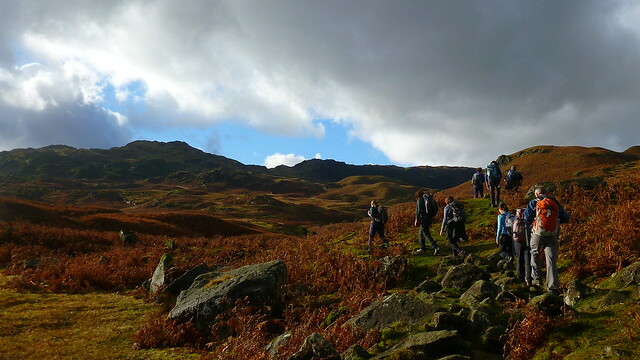 No time to hang about so we plodded off along the broad rock studded ridge that leads back to Grasmere. Scrambling about the various rocky piles is a delight and as there were several regular descent options we thought of continuing until we’d had enough and then head down. I was in my element as I love these complex turning ridges with the micro-landscapes of rocks, gullies and little scrambles, each one with its own character and particular views. 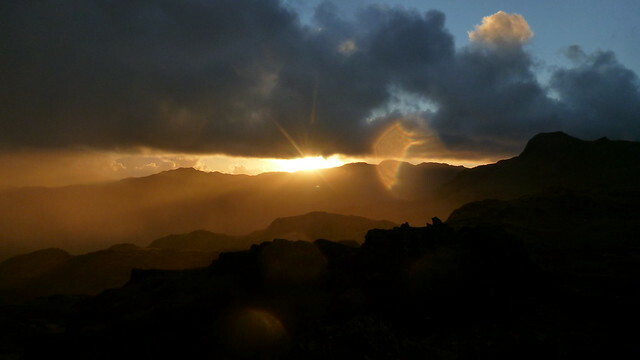 Pavey Ark and Harrison Stickle were now visible, looking dark and a forbidding cast in complete shadow. 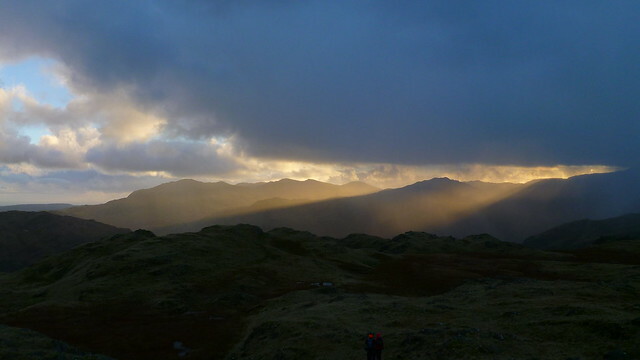 From then on we were treated to one of natures light shows. 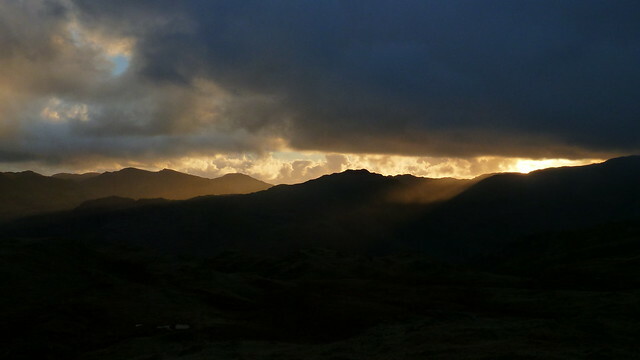 For 30 minutes the sun appeared and disappeared behind stormy clouds and hail showers over Langdale sending shafts of sunlight like searchlights across the sky and illuminating the rocks and hollows where we walked. We stood in awe and applauded the show. 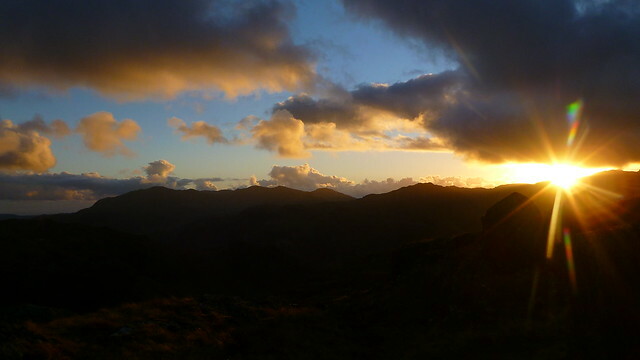 I’ve not seen a sunset quite like that before in many years on the hills. It’s one of those moments that despite the numb cold in the hands you just don’t want to tear yourself away and head down. Then reality kicks in. 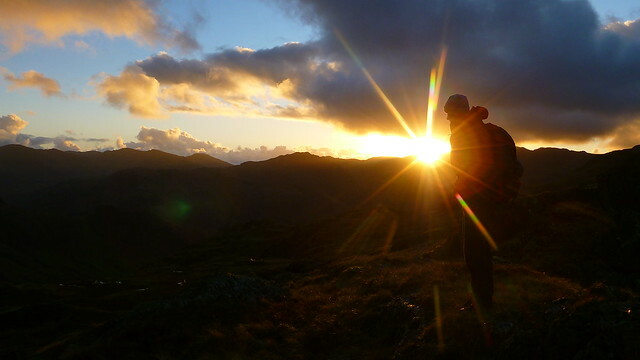 You’re 1,500 feet up in the hills, a few miles from the road on a compex ridge with steep descents – and you’ve just watched the sun set, yes SUNSET which normally precedes NIGHT and DARKNESS. You suddenly realise why you haven’t seen a soul in the last hour, they’ve all gone home. And of course you now realise there is not a chance in hell you’ll get back down in daylight across some pretty rough and boggy terrain. Still it was well worth it and how hard can it be. 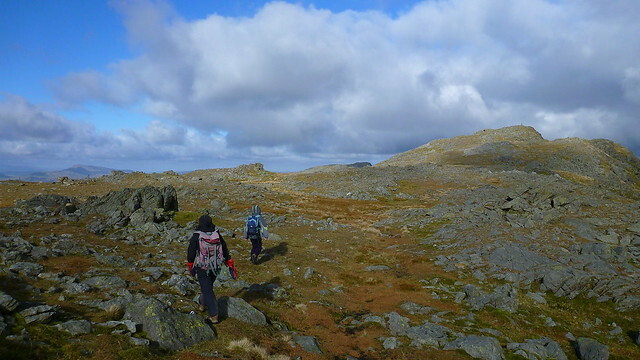 Then you look at the map and realise you have to traverse a countour-less tract called Blind Tarn Moss and you sigh – they didn’t give it that name for nothing. 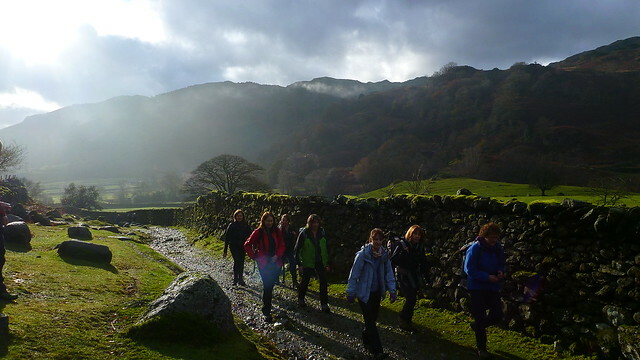 You look at your already sodden and peat stained trail shoes with a knowing look and head for the pub. 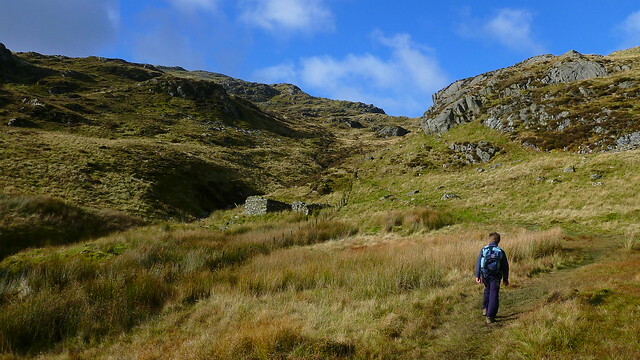 So how was it, this treacherous descent through the crags and bog. Well I’ve built it up for dramatic effect as any good writer would, but it was actually great fun (apart from one clumsy oaf who turned his ankle in an extravagant and expletive filled manner on the flat farm track at the bottom of the valley). 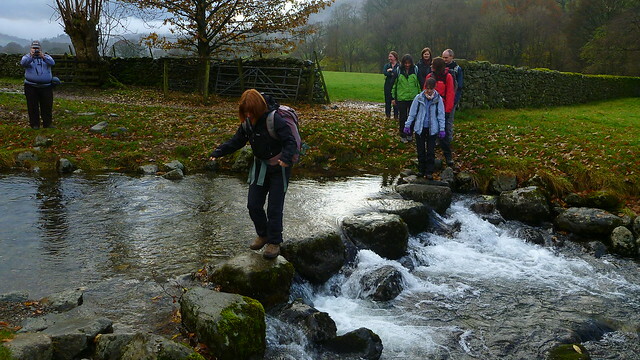 It was very, very wet and slippery with numerous slips and slides and several unpleasant watery graves for any remaining dry feet but we all had a great laugh and, well, we did have the hillsides to ourself. Actually got me thinking I should do a night hike in the winter. On a clear frosty moonlit night above the trees I reckon it would be rather splendid. Back at the pub by 6 and time for a cheeky pre-evening meal beer to celebrate a fine day of fine views great walking and breathtaking views. Like the party animals we are, we ate and drank heartily (some even stretched to 3 pints) and crawled into bed at the ungodly hour of 11pm. We’d have to do it all over again the next day – bring it on! 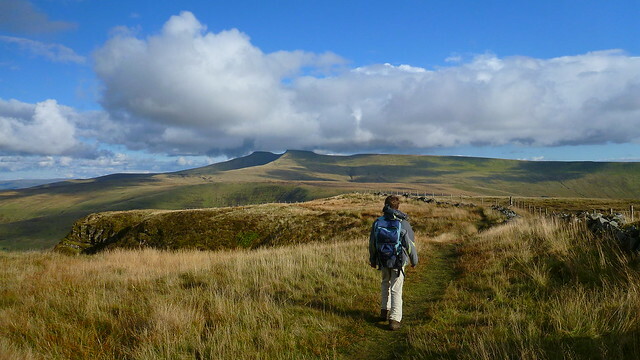 This is one of my favourite walks in the Brecon Beacons. Slightly away from the main hotspots but with a sense of spaciousness and air from the long walks along the edges. 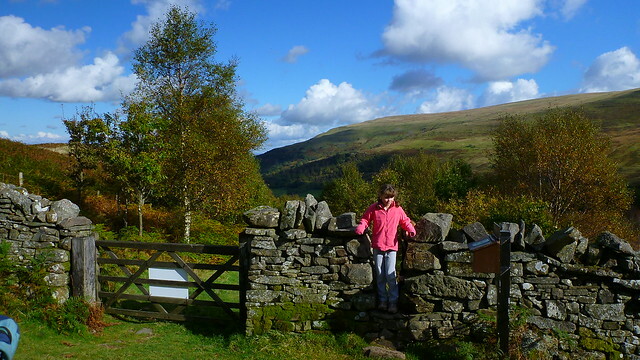 Apart from one very short steep section in the middle (or start depending on which way round you walk it) the route is easy and mostly level and ideal for families looking to introduce the younger ones to more mountainous terrain. It was just me and D today, TBF having been compelled to take L to the Remembrance service with her Brownie pack at our local church. 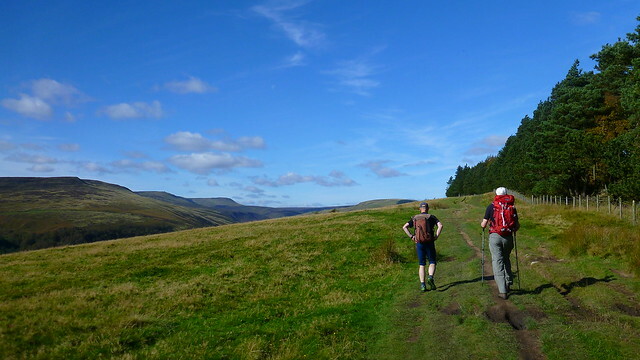 We’d debated between this route and Pen-y-Fan from the south but as we approached Brecon under clear skies, Pen-y-Fan itself was smothered in cloud so we defaulted to this alternative. I’ve done this walk before last year so knew that D would really enjoy it as would I. The parking area was absolutely crammed with cars perched in every available spot. We returned to the bottom of the road to start the walk there, all it added was a short walk from the lower car park to the waterfalls and avoids having to finish the walk with a steep climb to the original start point. I’ve been lazy again with the route map so just use your imagination to create the extra little bit to the car park just south of the marked route! 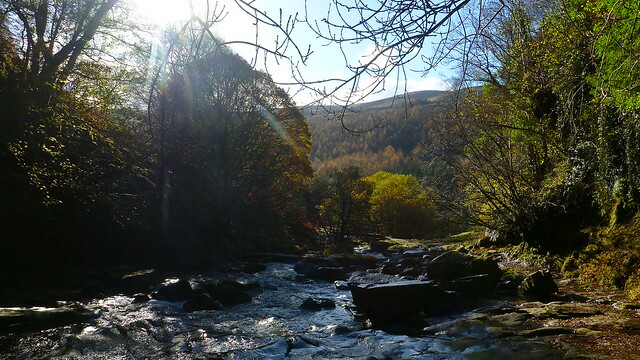 The walk up through the trees dappled with autumn sunshine was a pleasure with the sound of the waterfalls on the Caerfanell River below us. There was a path lower down on the opposite bank that keeps to the riverbank so I’d follow that in future. 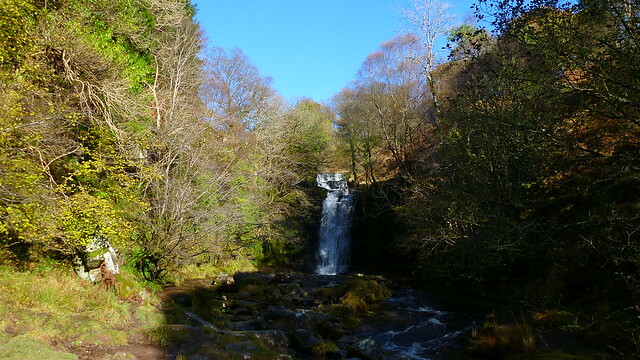 We reached the bottom of the steep climb to where we should have parked, with more waterfalls visible on the much smaller Nant Bwrefwr through the trees. We decided to take a look at the big waterfall on the Caerfanell before we headed up. It’s an impressive one and considering the number of cars about, deserted. We managed to get right up close on very slippery rocks to admire the heavy flow over the edge. 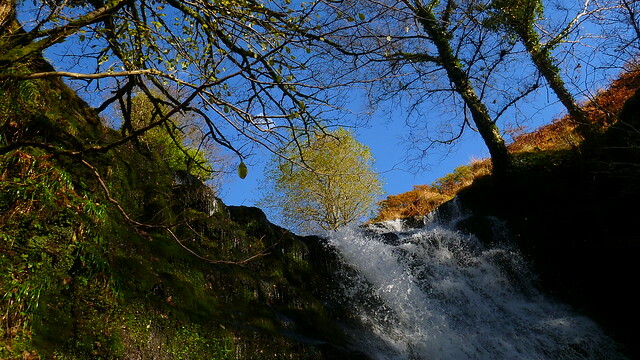 I do like a good waterfall, probably due my propensity to climbing them in a wetsuit! As we returned it became obvious that doing the original route in reverse was a much better plan. It would give a much different flavour than when I’d walked it the other direction with the added bonus of being in the sun as we walked up the Caerfanell valley. With the low sun we would have been completely in the shade later in the day. Had we found a space in the car park at the top this would not have occurred to me. Serendipity is a wonderful thing. 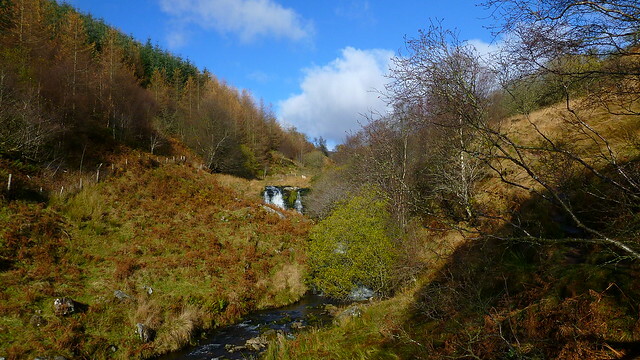 The walk up the valley was splendid with autumnal colours and waterfalls every step of the way. As is the way of things this year, every step was wet and muddy but I’d gone with lightweight boots rather than trail shoes for a change. 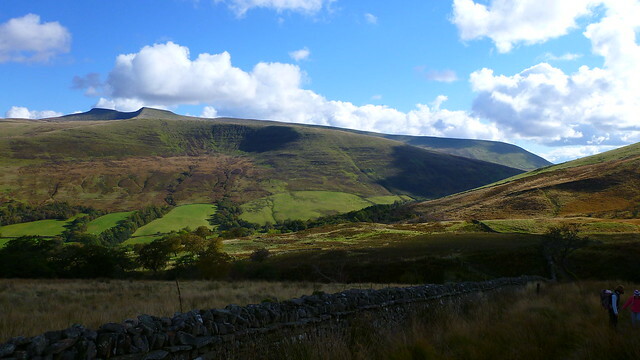 As the valley opens out there is a short climb up on to the open grassland of Waun y Gorlan with all the edges to be traversed later in the day towering above us, beautifully lit by the low sun. Facing us was the savagely steep climb up the nose of Gwalciau’r Cwm (I’d remembered it’s steepness in descent the last time). 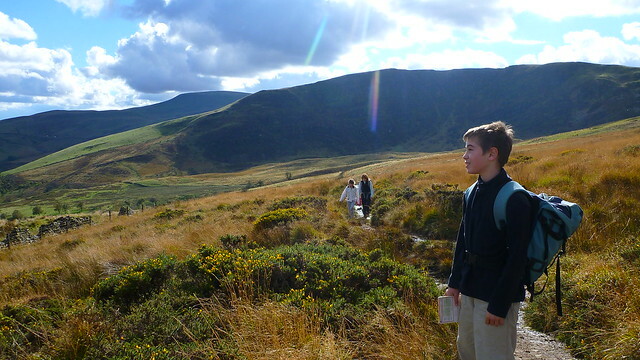 D found this grassy climb hard-going and seemed a little off the pace most of the day – a tough week a school he told me. Young people today – no staying power. It’s a mercifully short climb; only about 500 feet and the views from the top are breathtaking. From there the route is just a joy. 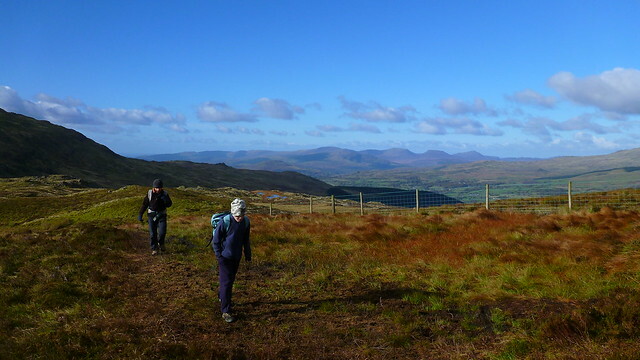 A thin a little used path takes you around a succession of edges with huge open spaces below you as you progress towards Carn Pica. 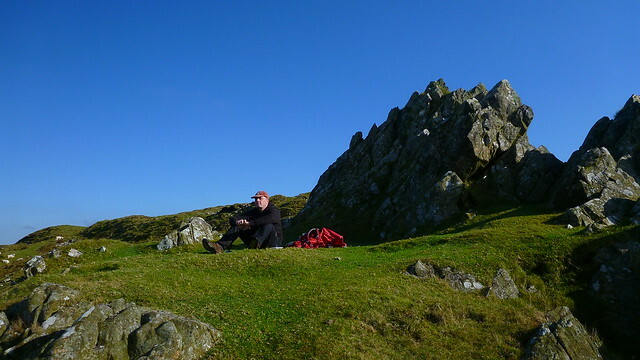 Halfway along we found a little sheltered spot where the ridge from Allt Llwyd joins and took lunch in the sunshine. The views out south and east were sublime. 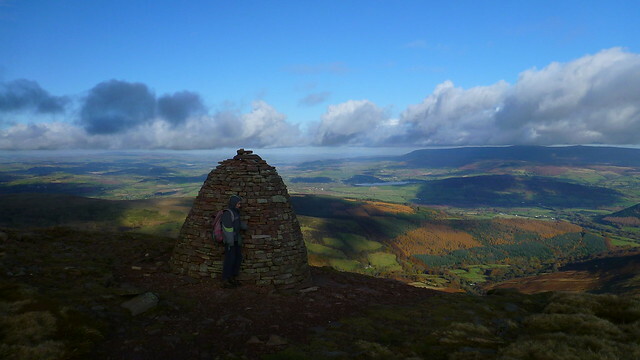 The sugar loaf held the attention and the Black Mountains looked dark and forbidding, smothered in dark clouds. To the west we could make out Swansea Bay and the distant outline of the Gower with the Mendips, Quantock and Exmoor hills faintly visible on the horizon. 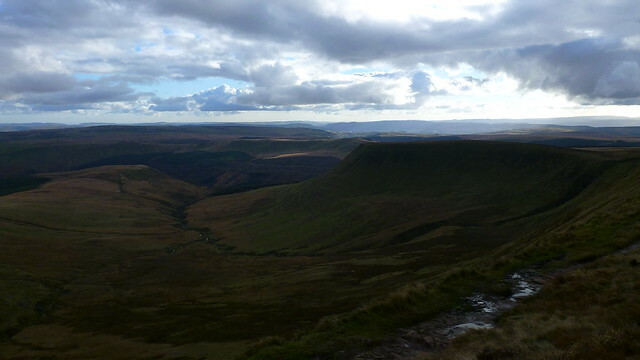 North looked less than promising however with dark clouds massing and Pen-y-Fan still brooding in misty clouds. 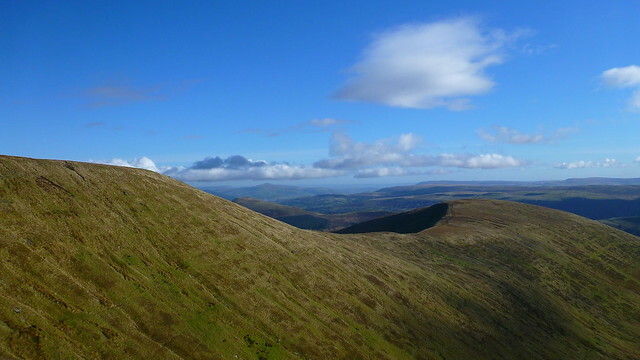 We pressed on along Craig-y-Fan to the massive and well-constructed cairn on Carn Pica. 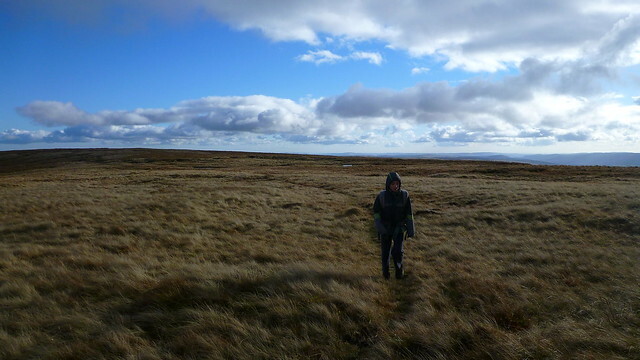 We’d now hit the wind and it was too cold to linger so we continued snaking around the boggier bits on thin paths and a detour to the un-named summit above Waun Rydd. 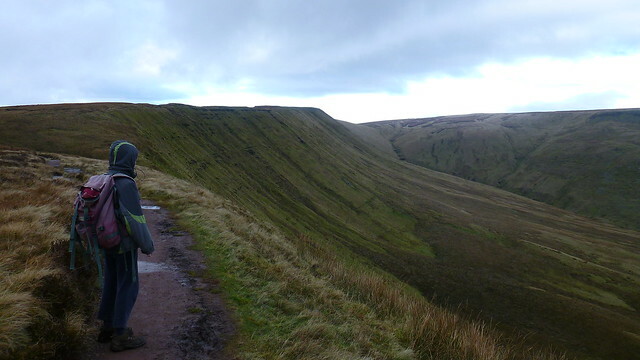 The weather had changed and it was now grey and overcast as we turned and headed along the edge of Graig Fan Las. It’s one of the highlights but with the dark clouds it took on a more threatening air and the sunny skies of earlier had gone. 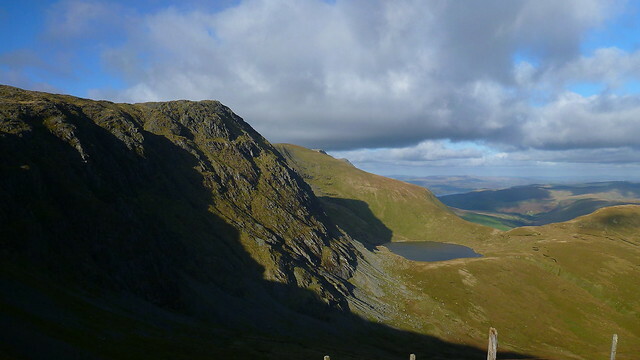 It’s still a terrific section with airy drops into the Caerfanell valley below. We met numerous people on our way up all asking directions to the cairn that marks the spot of an air crash from years earlier on the opposite side of the valley. Perhaps some of the crowds were to pay respects as this was Remembrance Sunday. 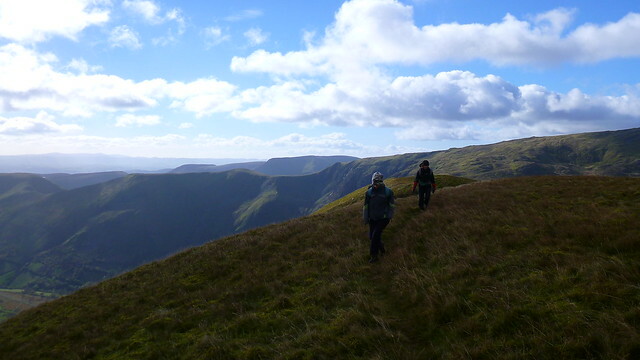 We carried on, progressing easily and quickly along Craig-Fan Ddu and the steep descent to the waterfalls on the Nant Bwrefwr. As we approached the car park the sun came out again and the skies began to clear giving us a warming glow before we plunged into the forest. 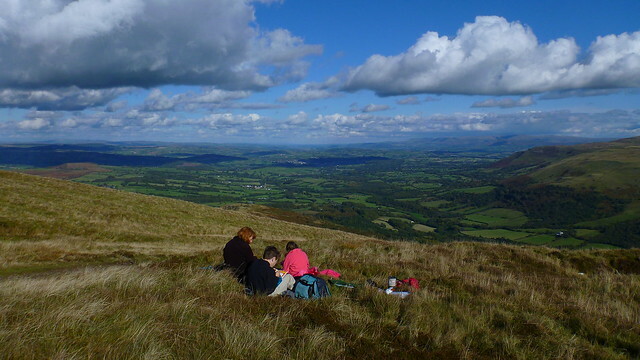 I’d travelled back down to Wales to join up with the family in Clarach. TBFs mum was with us and she kindly agreed to look after L for the day so we could head off for a full day. 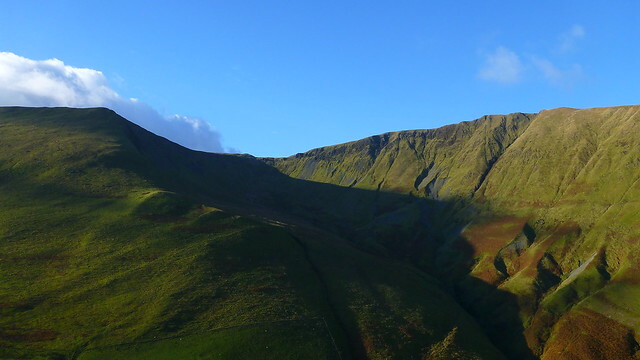 We had thought about Snowdon but I couldn’t be bothered with such a long drive on what promised to be a fine day. A check of the map revealed that the southern end of the Arans was no more than an hours drive away and even though I’d done this route last year I thought it was well worth repeating. I’m shamelessly lazy so I’ve just re-used the route map from last time. 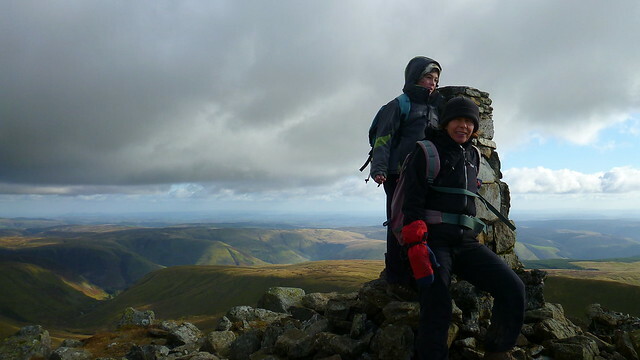 It’s the same walk other than the omission of Glascwm, a fine summit but too far for shorter day. 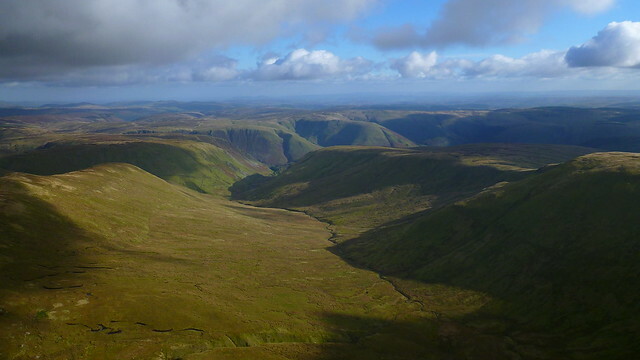 Cwm Cywarch is one of the finest valleys and mountain corries I know and provides a stunning and secretive entrance the Arans. The car park was busy and startlingly cold but with sunshine and with the massive cliffs above us it’s an exciting place to begin a walk. 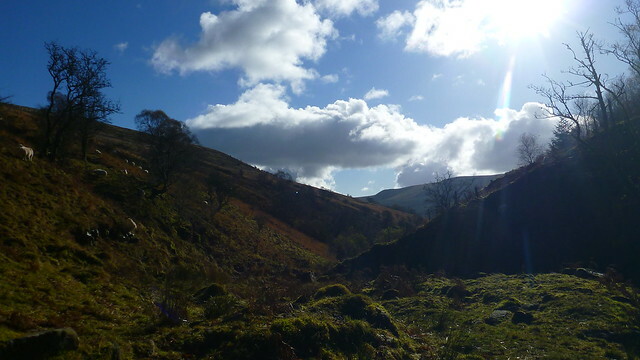 The route up into the higher reaches of Cwm Cywarch is wonderful, a picture perfect rocky valley surrounded by peaks and filled with tumbling streams and waterfalls, backed by blue skies and scudding dark clouds. I recalled my visit last summer when I sat on the rocks in the warm sun and paddled my feet in the stream – not that kind of day today. We made swift progress. D is now of the age where he is starting to pressure me for pace uphill and leaves TBF in his wake. This was easily his toughest day in the hills. 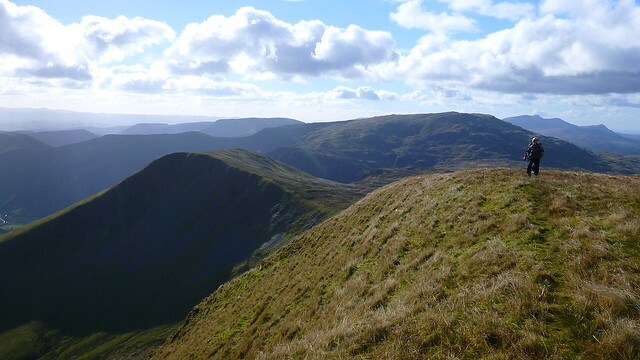 Cadair Idris was his previous highest summit but the Arans are much wilder and untamed. 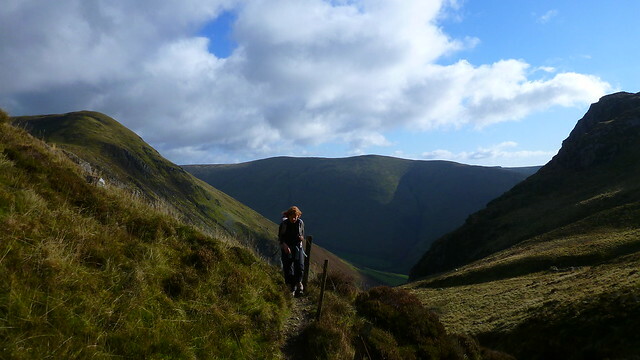 He seemed thrilled by the path up the valley as it twisted and turned amongst the rocks and finally emerged onto the broad saddle between Glascwm and the Arans themselves. 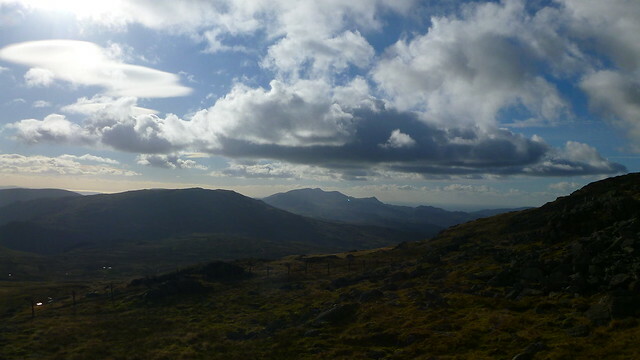 The view was stunning with the Rhinogs standing proud above the Mawddach estuary and the Arenigs and its outliers to the north. Back to the present. The route from the col traverses some seriously boggy ground, most of the worst parts have planks lain across but it’s still a soggy old spot. I’m becoming a devotee of trail shoes rather than boots even in such terrain. However one issue I hadn’t thought of is when the ground is frosty, the bog-water is cold (obvious I know). My feet were cold most of the day so much as I love the light weight and nimbleness they provide, in winter I’ll need to revert to more significant footwear. 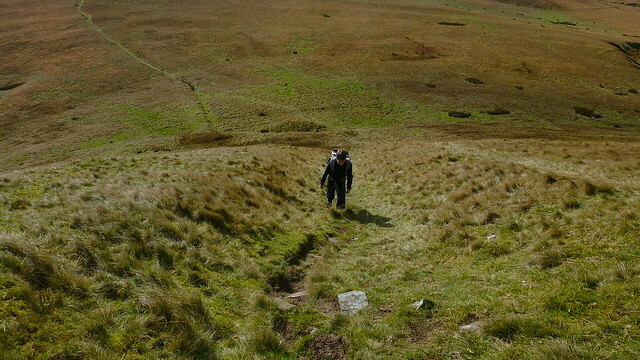 Rather than head straight for the summit I headed off-piste towards the ridge of Gwaun y Llwyni, rough but not as soggy as the main path with a steep climb to the ridge. 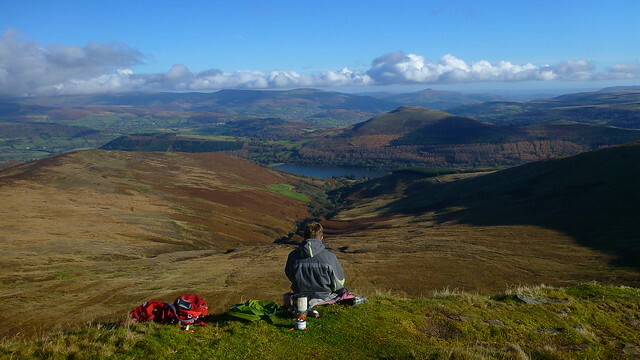 It’s well worth it for the sensational view back down Cwm Cywarch and across Hengwm. 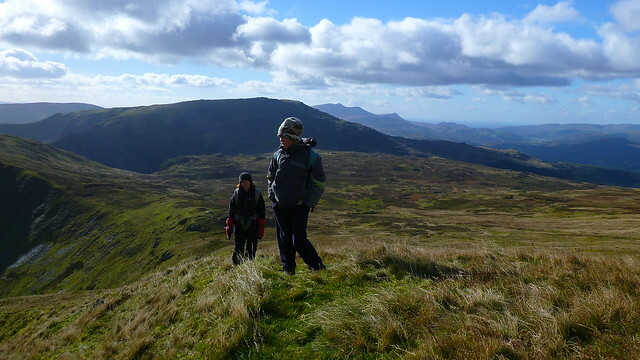 The ridge gives wonderful grassy stroll high above the Hengwm with views back across to the distant Rhinogs and beyond. The ridge ends abruptly above an immense grassy cwm at the head of Hengwm a superb spot that I’d used the previous year for a stop but far too windy this time. I’d spied a collection of rocks on the path to Drosgol that looked ideal for lunch and so it proved, out of the wind and perched above Hengwm for great views. I’d wanted to lunch on the summit but I figured it would be a little chilly. Refreshed we continued around the NW rim of Hengwm to climb steeply up to the summit Drosgol with its memorial cairn to an RAF rescue airman who died after being struck by lightning. 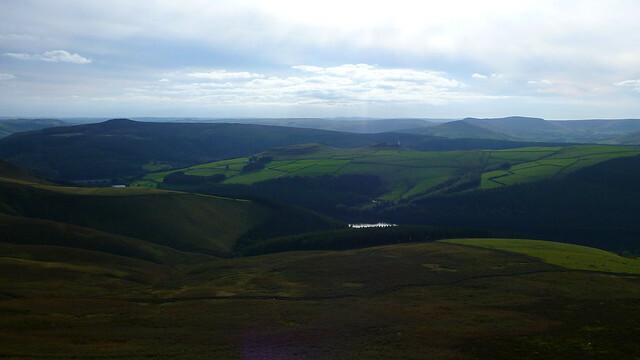 It’s a truly marvellous, albeit solemn, spot right on the edge of the grassy cliffs with far-reaching views to the Berwyns, the Long Mynd and what I’m pretty sure was the Wrekin near Telford. 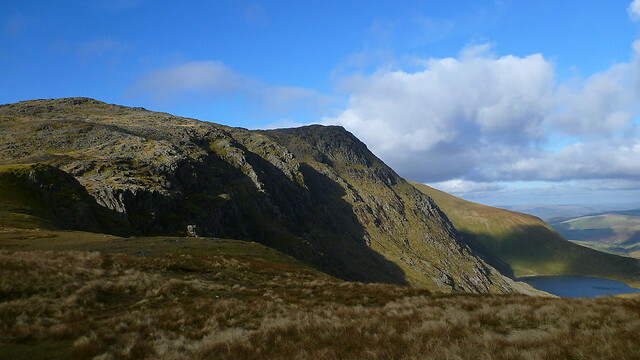 It also affords a view across the rugged cliffs of Aran Fawddwy cradling Craiglyn Dyfi at their feet and across to Aran Benllyn. 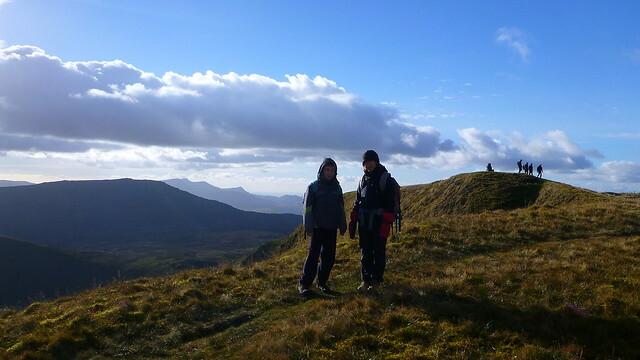 The walk from Drosgol and through the easy angled crags to the summit is just a pleasure. 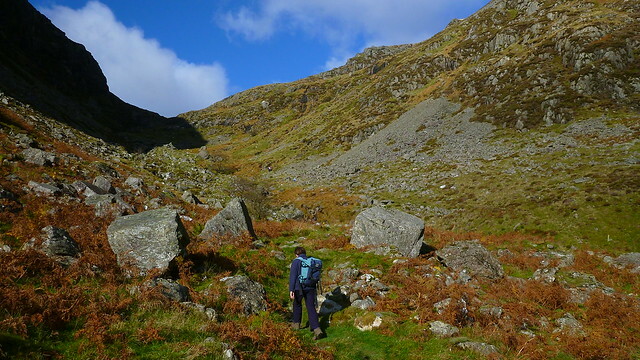 A thin path works it way through the crags but simply finding your own way, twisting and turning through the crags and hollows is mesmeric. One of those short sections where the mountain seems to draw you to the top effortlessly. 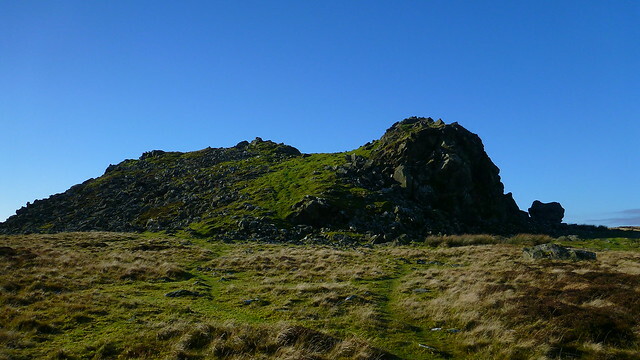 The summit is a very broad level plateau of rocks leading up to the main summit with its trig pillar perched on the edge of the cliffs. 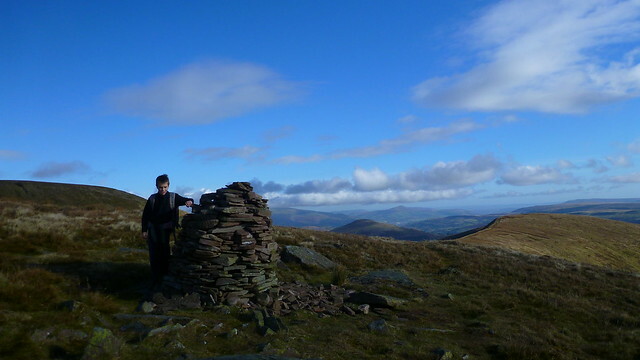 It’s a magnificent summit, comparable with the best Snowdonia has to offer but without the crowds. 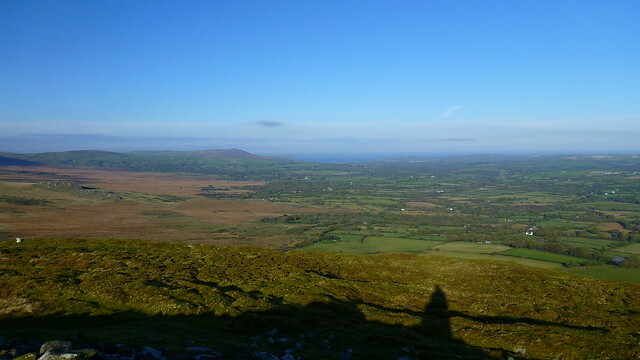 Standing alone the views are far-reaching taking in a full panorama from the Preseli Hills of Pembrokeshire, Plynlimon, Berwyns, Arenings, Rhinogs and across to The Rivals and Carn Fadryn on the Lleyn Peninsula. 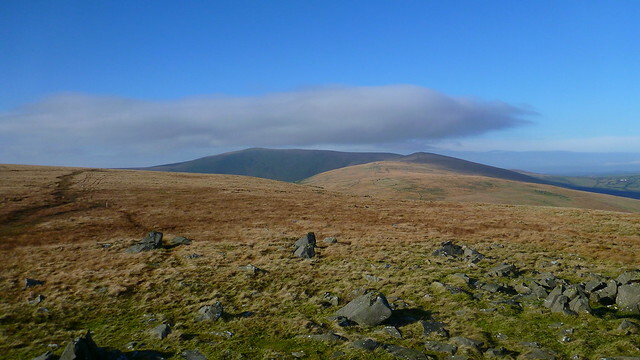 I fancy a night on the summit here on a warm summers evening, plenty of sites for a bivvy or possibly throw up a very small tent. D was chuffed to climb his highest mountain to date and pretty good one at that with a real mountaineering flavour. 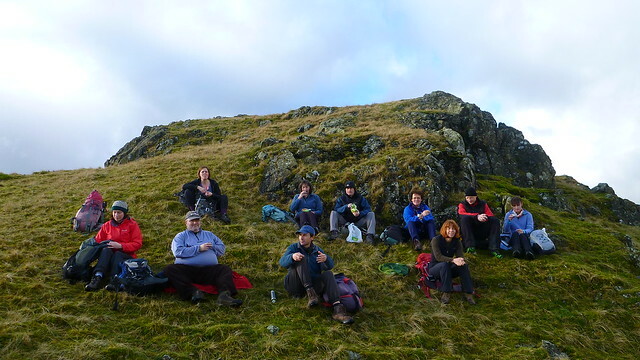 We sat on the rocks for a quick snack, with our feet metaphorically dangling in Craiglyn Dyfi far below The cold wind and march of time meant it was an all too brief stop on the summit so we reluctantly turned tail and retraced our steps to Drosgol. 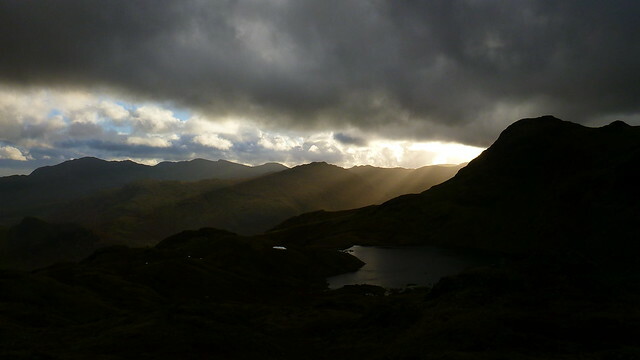 There had been scudding cloud all day that had added a sense of threat and majesty to the views but as we descended the clouds began to break and we were treated to some spectacular late-afternoon, low-angled sunlight views that are a such a feature of these autumn and winter days. It just got better and better as we crossed Drosgol and headed down towards Hengwm. 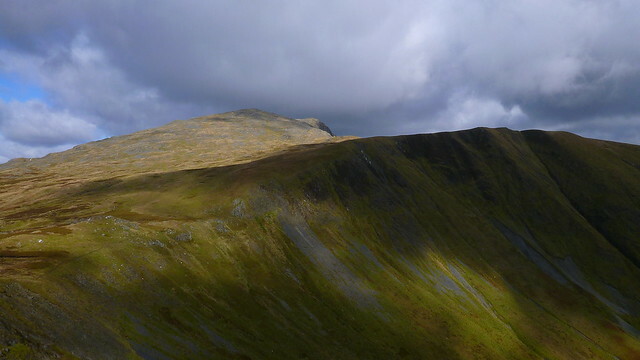 The sunlight on the Hirnants was highlighting every gully and slope giving a real sense of their complex local topography. 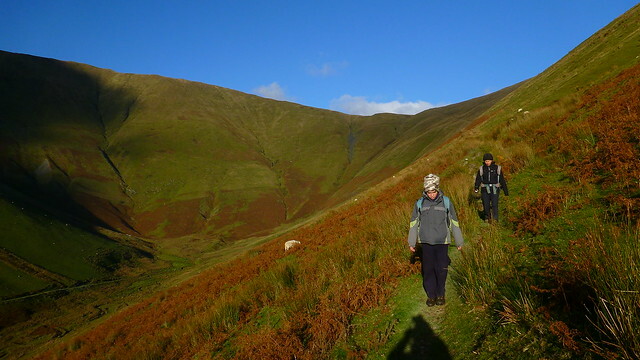 I had both a real (from the grassy slopes) and metaphorical spring in my step as we descended towards the final highlight of the day, Hengwm. 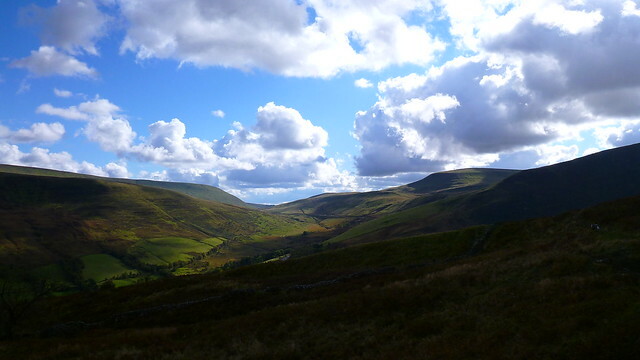 It’s the most perfect grassy glacial valley you could imagine towered over by the grassy ridge and corries of Gwaun y Llwyni to the west and Pen yr Allt Uchaf to the east. 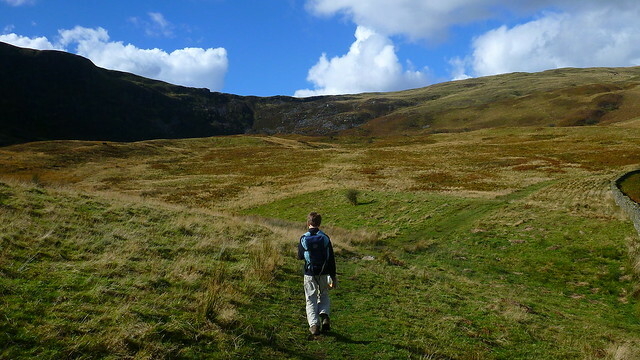 As with my previous visit the long grassy ridge of Pen yr Allt Uchaf looked inviting to stride across but time was too short and would involve either retracing your steps or a couple of thousand feet of steep grass to descend. Hengwm has the most amazingly created path that traces a straight line from top to bottom making for the easiest of descents (especially for those of us with dodgy knees). As the sun began to set behind Craig Cywarch it turned the whole valley a shade of gold that matched my feeling of a truly treasured day. All too soon the sun disappeared, the air grew instantly colder and we quickened our pace back to the car. 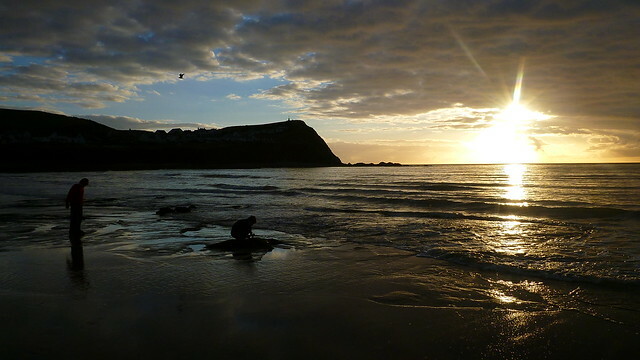 It had been a day to remember and a fitting end to the British Summer Time as the clocks turned back and the long winter nights were upon us. That feeling of cold, crisp air had fired my passion for the “big” mountains. I wanted another day like it but a total washout the next day put pay to that! A feast from the chippy finished off the day perfectly – faggots chips and mushy peas – a classic. “Throw those curtains wide. One day like this a year will se me right” Enjoy! 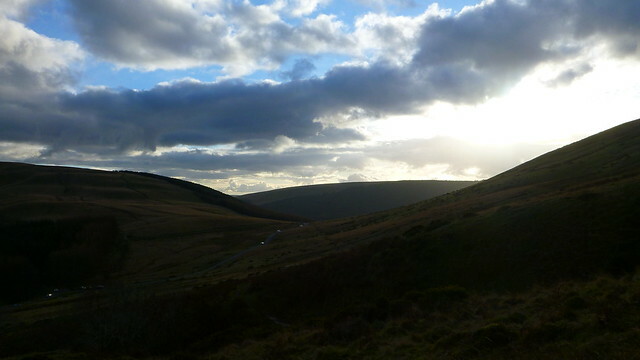 As I mentioned in my post about my stunning walk in the Preseli Hills, we’ve been staying in my parents caravan the last few October half-terms. It’s normally close to D’s birthday so this year as a special treat we invited his best friend J along. We managed to keep it a secret until his birthday and it was a really exciting surprise for him. 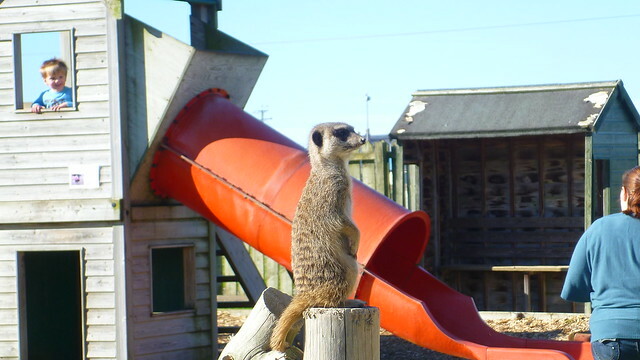 We gave D free range to choose what he wanted to do and for the first day he chose the local zoo or Animalarium to give it its proper name at Borth. 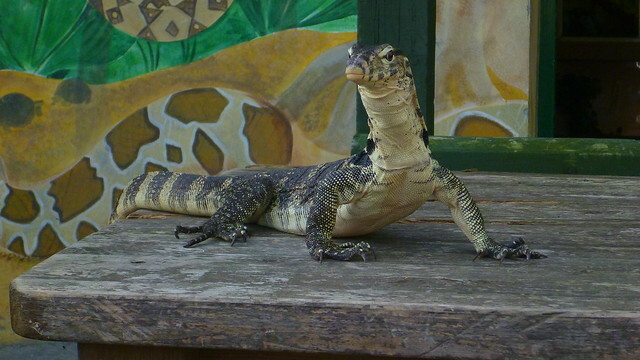 It’s a very low-key place tucked away behind the sea-front and it specialises in finding a home for unwanted exotic pets. I’ll not enter into the zoo debate here as I know there are strong feelings about whether it’s right to keep wild animals in captivity and I share those conflicting feelings. For this day I’ll just try to share the enjoyment we had getting close to animals that in all likelihood would not have survived as their owners became tired of their exotic pets. As most of the animals are ex pets they are very much habituated to human contact to they approach you with interest and you get very close encounters. A large majority of the animals are primates and small monkeys which you can feed by hand. 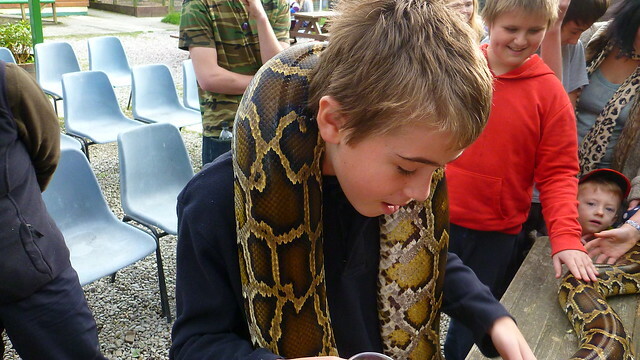 The kids loved this element and really enjoyed the much closer connection with the animals. 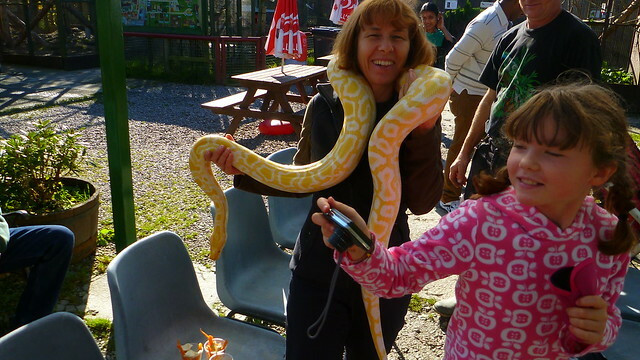 They also have a regular program of closer encounters throughout the day and the kids especially enjoyed the meerkat feeding and the reptile encounters. Nothing beats holding a massive python to give you that close connection with a giant of the jungle and the whole thing was handled with a very relaxed and informal air. It’s only a small place but we managed to spend the best part of a day there. 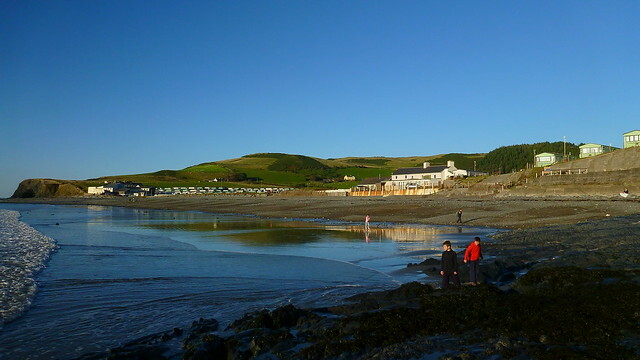 I’m amazed it survives tucked away in such a quiet little known coastal backwater as Borth but it appears to be thriving and the owners are friendly and informative. Our favourite animal was Mango, the black-capped brown capuchin, all box-head hairstyle and attitude – he was a treat. I hope they can continue to thrive and remain a hope for these “pets” that have no home. 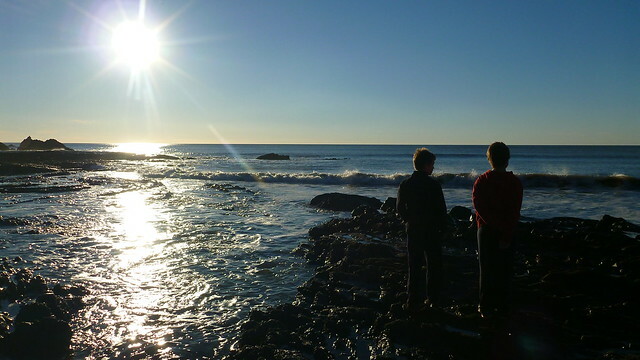 Before we went home we took a late afternoon stroll on the beach to look at the petrified tree stumps. 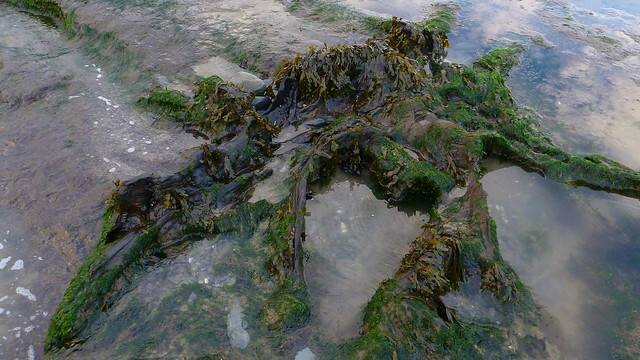 These are the remains of an ancient forest and there several spots along the Ceredigion coast where you can see them at low tide. 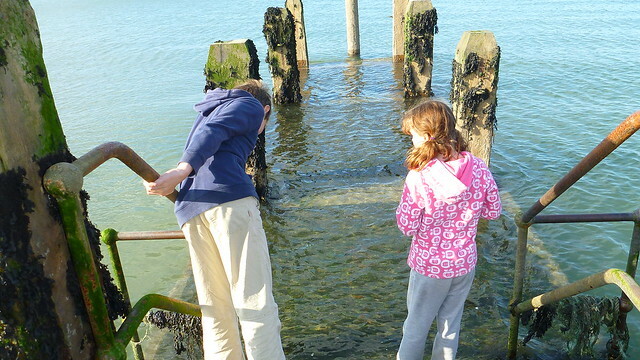 The kids and adults alike were fascinated and I was amazed how they survive. They would surely get washed away in a major storm you would think but they survive. Despite the fact that I spent most of my childhood exploring this coastline, I had no idea about this feature until earlier this year. 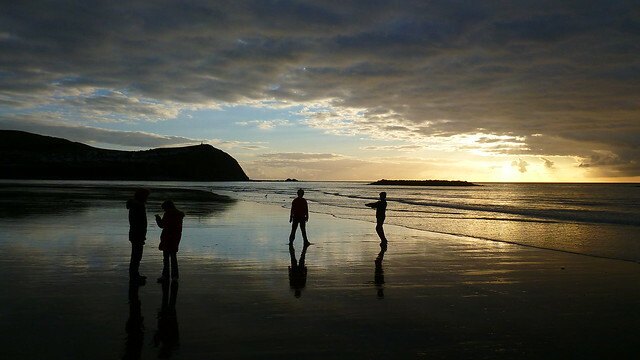 As the sun started to set the low light behind the clouds reflecting off the wet sand gave some stunning images. 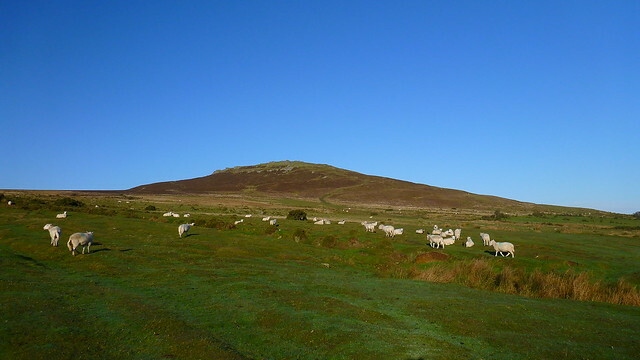 The next morning while the kids went swimming, I headed off early for a fantastic walk under clear autumn skies in the Preseli Hills. 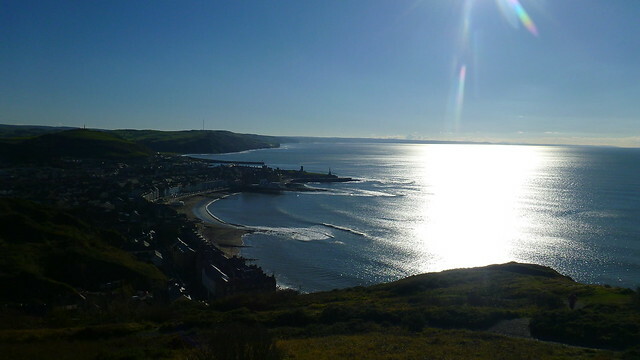 In the afternoon D wanted to show his friend the local eminence of Constitution Hill that separates Clarach Bay from the town of Aberystwyth. It was a stunning afternoon and the views were spectacular. 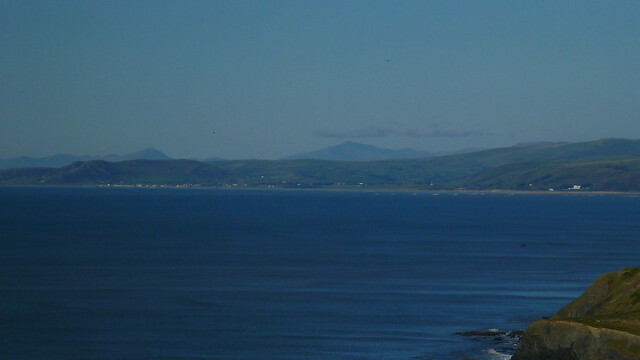 To the north beyond the coast was Snowdonia with Snowdon itself clearly visible, and the Lleyn Peninsula with Carn Fadryn and The Rivals there as always. 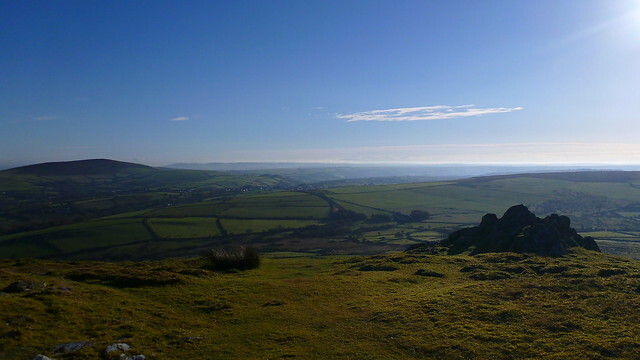 To the south beyond Aberystwyth, the Ceredigion coast, Pembrokeshire and the Preseli Hills I’d climbed in the morning. There is a range of kids stuff at the top so the kids played ten-pin bowling and bounced on the bouncy castle while TBF and I enjoyed the expansive views. 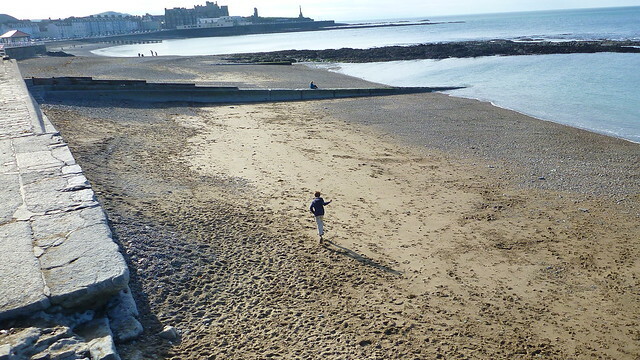 We took a further stroll on the beach in the afternoon sunshine on our way bacxk to the caravan. I had to head home that evening but TBF and the kids stayed for the week. They got lucky with the weather and had some warm sunshine while most of the rest of the UK was blanketed under cloud and drizzle. 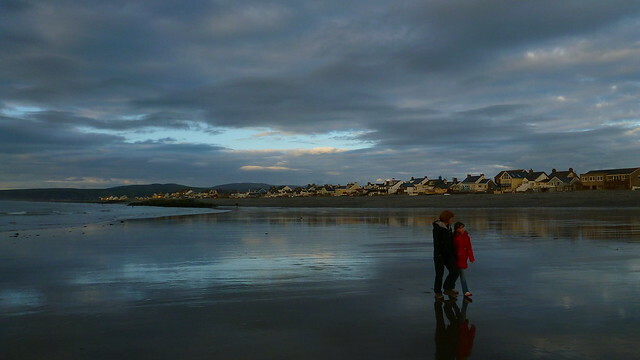 They took some walks in the hills, along the coast from Borth and had a happy day on the beach in Abertystwyth. I used to work as a sales rep for a small company that sold plastic building products (they were famous for their yellow buckets which my so-called friends found disproportionately amusing for some reason). 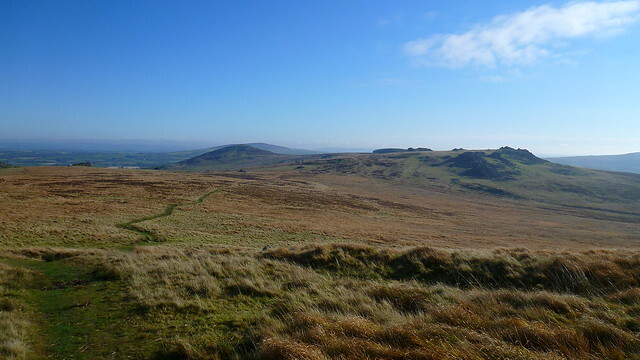 Most of south Wales was on my patch and one very dark, grey and dreary afternoon I drove across the high road over the Preseli Hills and saw them as nothing more than a drab bit of moorland and never gave them another thought as a walking destination. 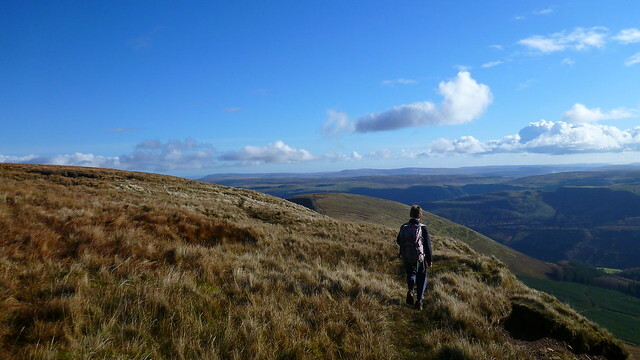 In my quest to visit the lesser known corners of our uplands I thought it was time to give them a proper look on foot. As you’ll see, neglecting them for so long was an error. 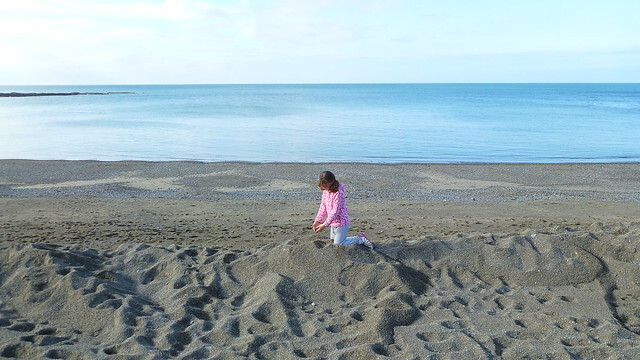 We’ve been spending our October half-terms in my parents caravan at Clarach Bay for the past couple of years. When I say “we”, TBF and the kids spend the week while muggins goes to work and only spends the weekends away. This year was no exception and I’ll post up about the family times in an upcoming report. On the first Sunday the weather forecast was looking great so I agreed with TBF that I’d head out early for a morning walk while they went swimming and be back to spend the afternoon with them. I was up early on a cold, clear and frosty morning which when living in a caravan means a very cold making of breakfast and sandwiches with my gloves on – caravans are not great providers of early morning warmth. 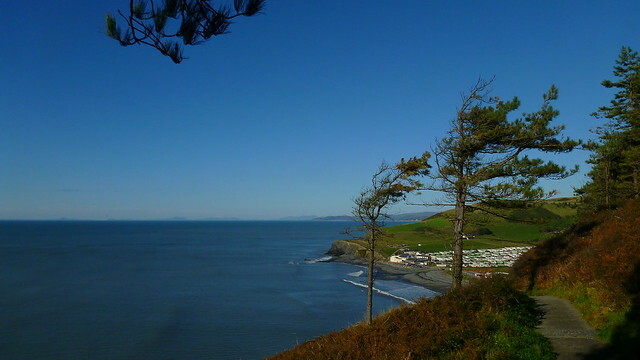 It’s an hour’s drive down the Ceredigion coast and the day’s weather and the views were absolutely superb. 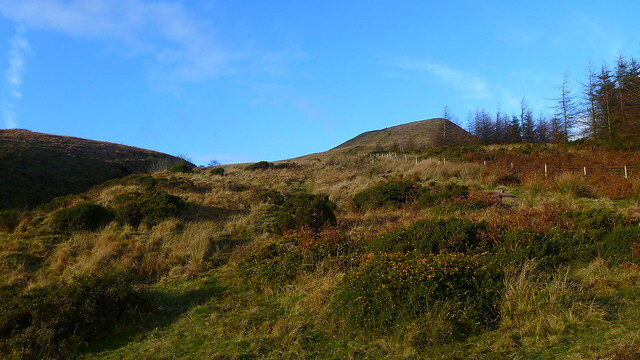 I arrived at the small and chilly parking area just outside Crymych before 9 and eagerly headed off towards the hills under a deep blue sky. 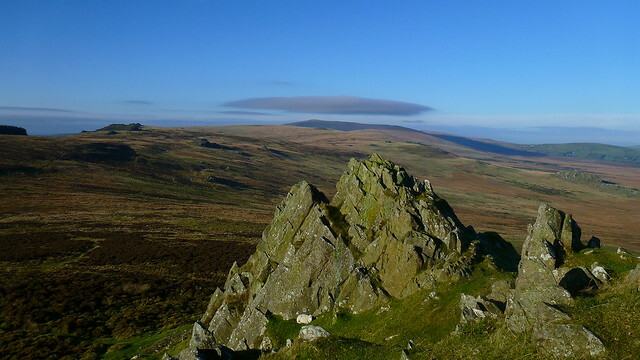 The Preseli hills are arranged as long broad ridge arrayed east-west and I was headed first for the most easterly top Foeldrygarn (the rounded or bare hill of the three cairns). 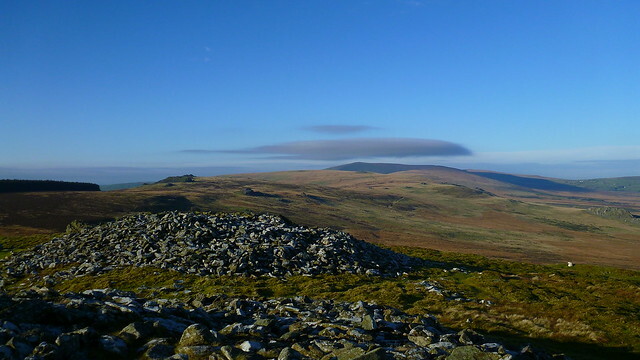 The car park is quite high up and the summit less than 400m so it only took 20 minutes to reach the summit, crowned with 3 huge bronze-age burial cairns and the remains of an iron-age hill fort. 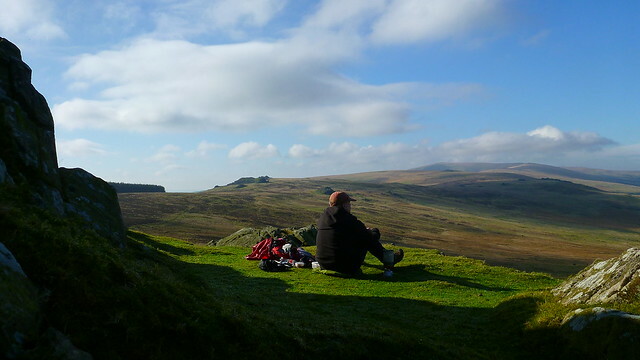 The views were breathtaking and revealed the majesty that are the Preseli Hills. 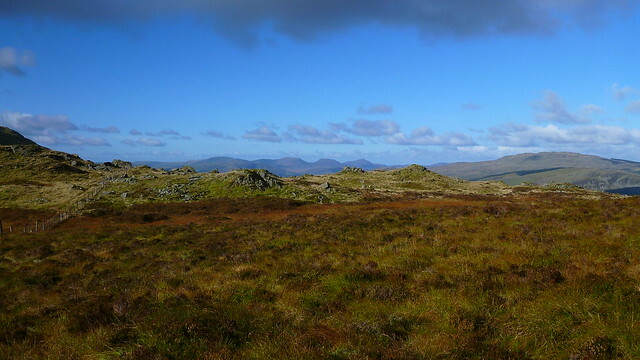 A rolling ridge of grassy tops crowned by a succession of rock outcrops marching westwards. 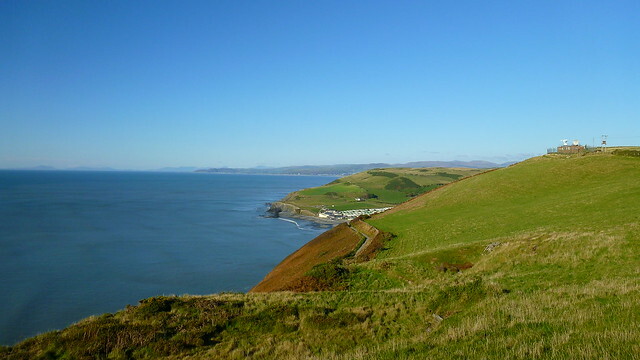 Out west was the Ceredigion coast and Cardigan Bay and the patchwork of fields in between. It just begged to be walked and had an impression of remoteness and altitude that belied its proximity to the coastal resorts and modest height. Foeldrygarn itself is an impressive little mountain in its own right, bristling with rocky outcrops of its own and numerous winding paths. It’s another to add my list of “Small mountains with disproportionately great views”. 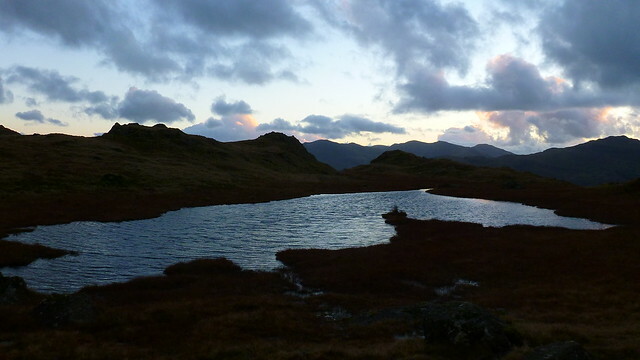 On a calm summers evening it would make a magnificent spot for wild camp. Still it wasn’t in any way detracting from the views which were still amazing. 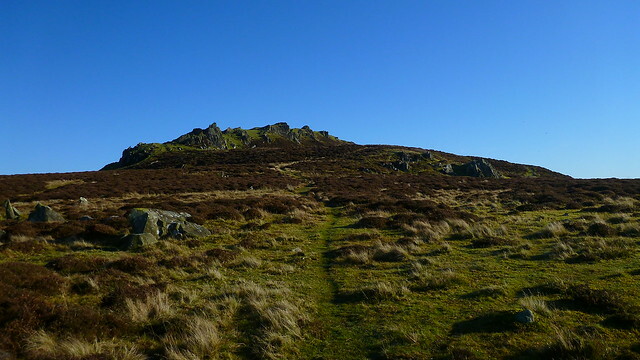 The next rocky tor is Carn Gyfrwy, a grassy mound topped with jagged rocks that gave a fine view across the nearer tors to the higher summits beyond. 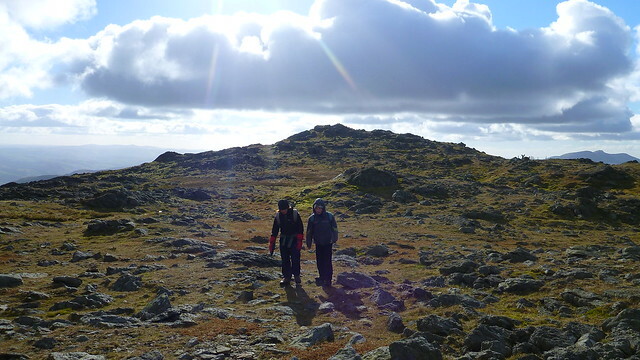 Onwards across the grassy boulder strewn summit towards Carn Menyn and a quintessential piece of British history. 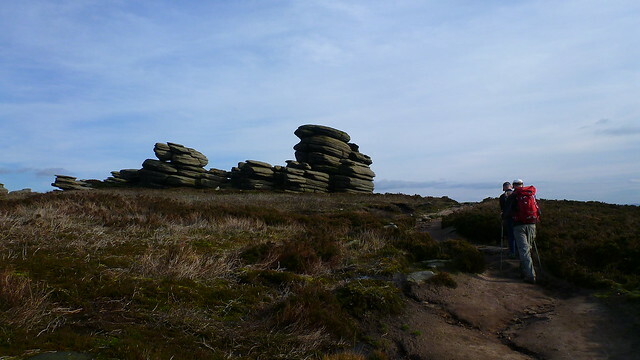 It was from here that the bluestones (or spotted dolerite to be more correct) that form Stonehenges inner circle were taken. Each one weighed an estimated 4 tonnes and was transported over 200 miles to where they now stand. Still, no-one knows why they were taken such a huge distance from this particular spot or more importantly how. As I stood alone amongst the rocks it makes you think what a strange and wonderful history we have in the most sublime and unexpected of places. 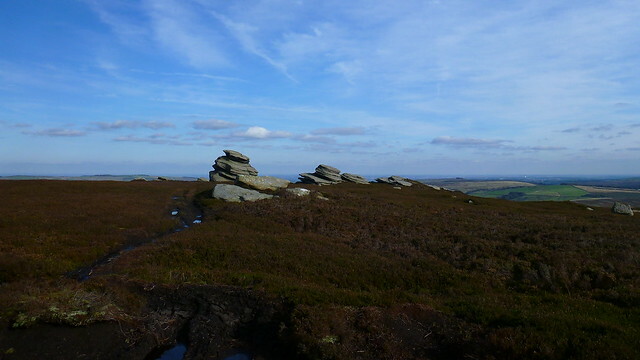 This section of the ridge was rippled with rocky tors and I wandered amongst them, fascinated by their shapes against the backdrop of the blue sky. In the distance I noticed a group and an argo-cat clearly out hunting. I’ve heard a few worrying tales of unfriendly landowners with guns of late so my pace slowed and I felt a little apprehensive as I headed towards them. 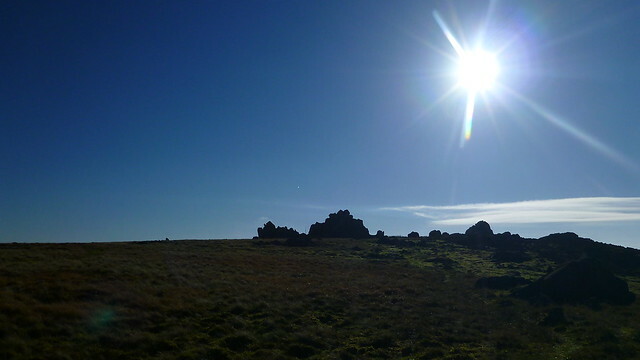 However I heard no gunshots and by the time I reached the summit of Carn Bica and the Beddarthur stone circle they were long gone. 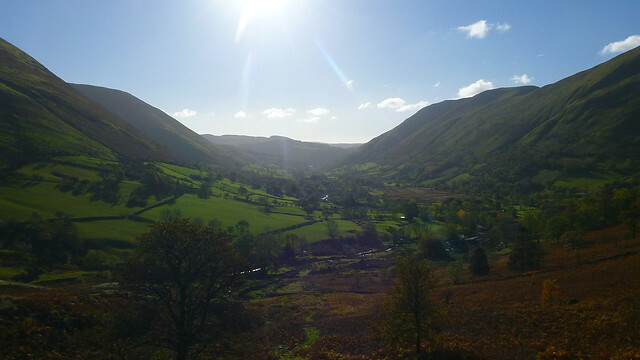 Beddarthur is another supposed burial-place of King Arthur (blimey that bloke covered some ground) and the local legend tells of him and his happy band chasing a giant wild boar called Twrch Trywyth across the hills. As I sat on the top for a breather I unfurled the map. 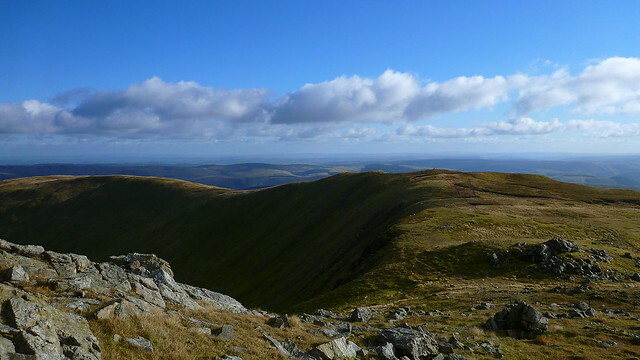 I had thought I could reach Foel Cwncerwyn (the highest point) or even Cerrig Lladron at the western end of the ridge. It was clearly a ludicrous plan given I only had half a day. The ridge looked inviting but rather than race to the top I thought it a better plan to wander back through the tors to Foeldrygarn and take a leisurely lunch on the summit. The full ridge traverse would have to wait for another day. 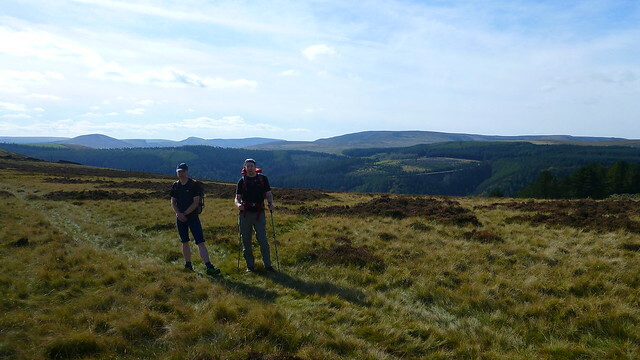 The problem with the these hills is that there is no obvious circular route – unless you fancy a long road walk along its southern flanks. As I wandered back it occurred to me that I am a little preoccupied with not retracing steps when I plan walks but without a good reason why. The views in the reverse direction were different to those on the outward leg and every bit as good. The same tors I’d examined took on a new character. I suppose where there is an obvious circular route it will always draw you on but this walk was telling me that when there isn’t one, simply retracing your steps is not necessarily a bad thing. I’d be interested to hear anyone else’s view on this topic. I saw my first walkers of the day on the summit of Foeldrygarn (although I had passed a couple of very energetic and very muddy mountain bikers) but they soon departed leaving the summit all to myself. Time to make the short walk back to the car and head home for some family time. I was home by 2 and back out again for another walk on the local coastal hill – but that’s another post…. 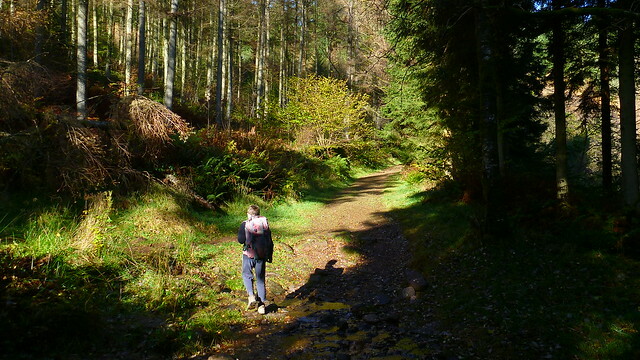 This was an autumn repeat of a longer walk I did last summer. 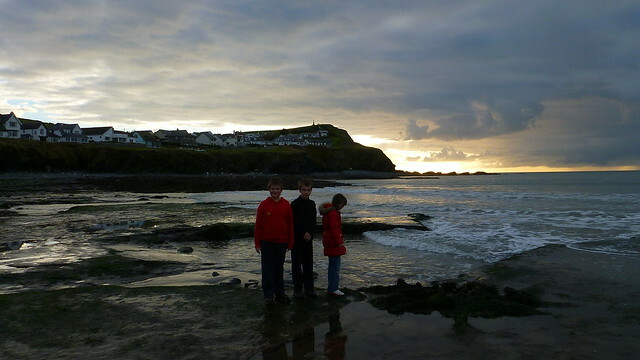 The darker nights and colder days were fast approaching so I wanted to get the family out as much as possible before the winter arrives and the TV and Wii become a more attractive option for the kids. 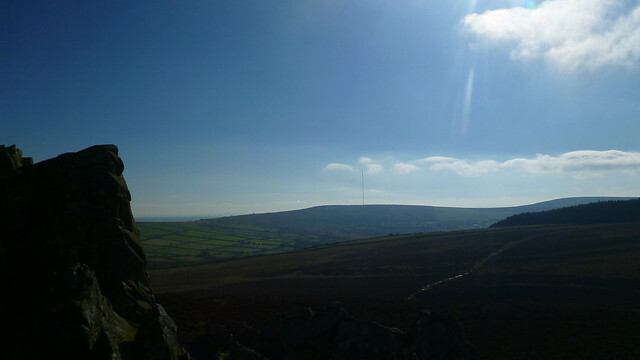 I was after a short walk but the weather looked promising enough for a day on some loftier heights. 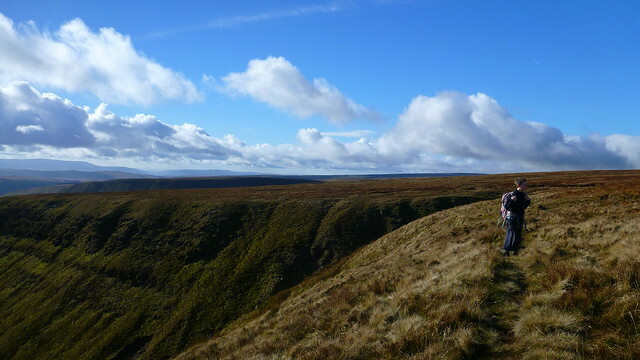 This walk combines a high start with a relatively short walk into a wonderful corrie and around its edge with expansive views. Just the ticket. 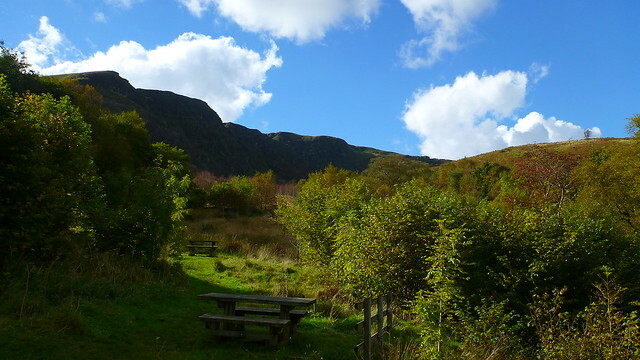 It was lunchtime by the time we set off from the car park on the A470 and headed up the broad path towards the dramatic cliffs of Craig Cerrig Gleisiad. 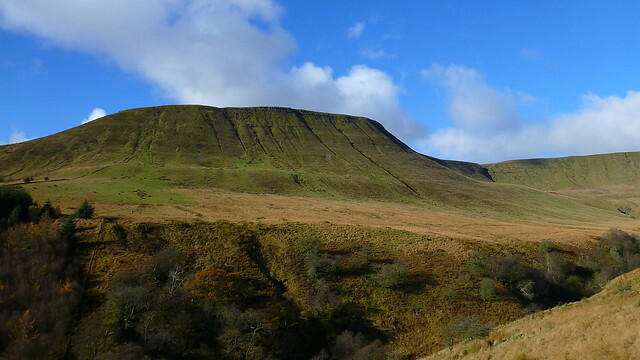 This area to the west of the main Brecon Beacons range is known as Fforest Fawr (The Great Forest), named for its status as a hunting ground rather than an expanse of trees. 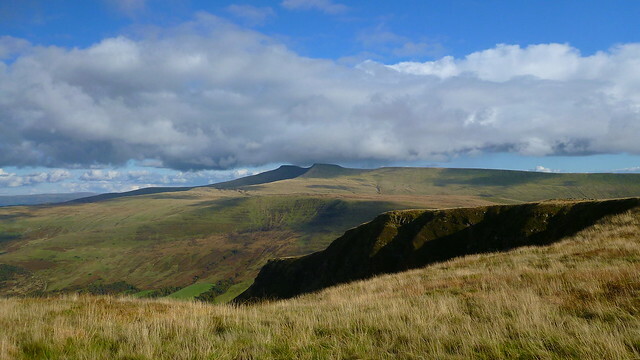 The area is a National Nature Reserve and within 5 minutes you are up into the heart of this wonderful and relatively little known cwm. 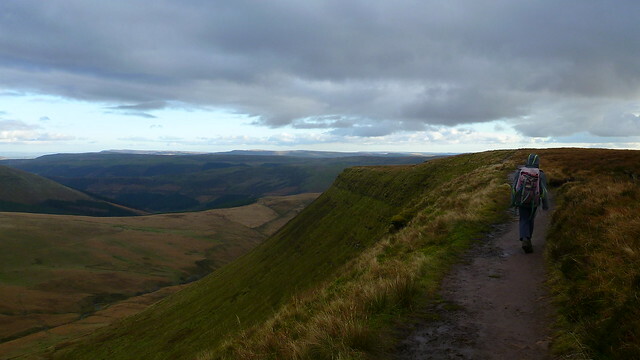 On both occasions I’ve visited I’ve seen few people compared to the massed ranks slogging up the grinding bore of a path up Pen-y-Fan from the Storey Arms a mile or so up the road. 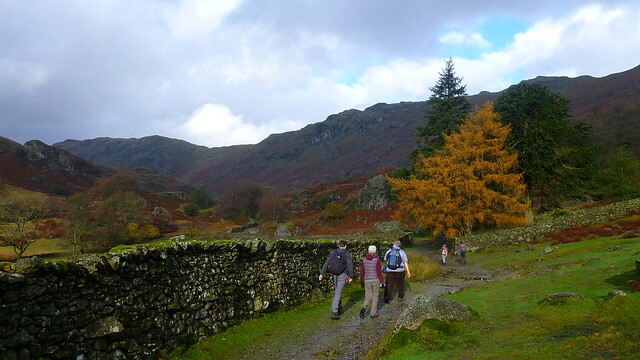 The path crosses a wall to a wonderful spot beside a tinkling stream where the full grandeur of the corrie is revealed. Sculpted by ice, it’s a home to several rare arctic-alpine plants such as Purple and Mossy Saxifrage. This is as far south as they are found in the UK and they don’t re-appear again until the high alps. 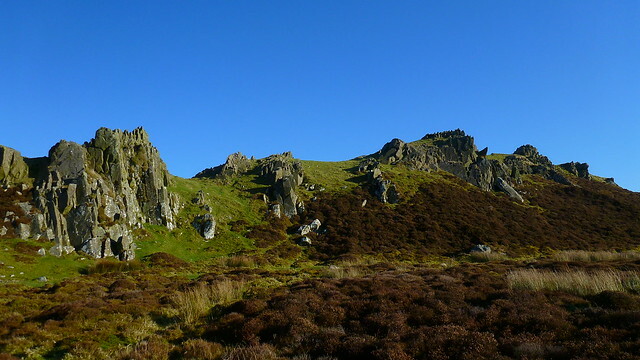 The cliffs, rather than rocky are cloaked in heather and trees with hawthorn, rowan, mountain ash and whitebeams clinging to the steep slopes. Peregrine falcons nest on the cliffs joined by merlins and red kites. 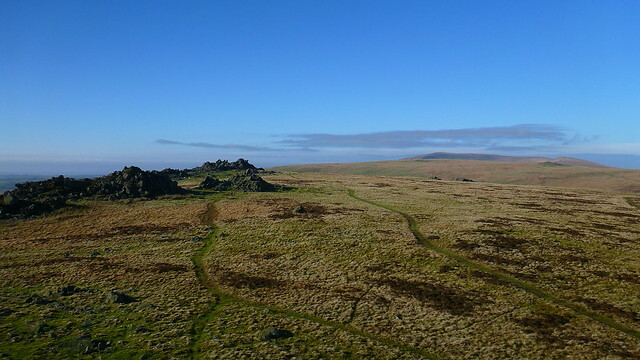 In the summer ring ouzels, skylarks and chaffinches fill the slopes with song and colour is provided with an array of butterflies that seem at odds with the higher altitude. On this day of cold air and bright skies we didn’t see much of this flora and fauna but the views were awesome. There were some dark brooding clouds mixed with bright clear sunshine and an exceptional clarity to the light and the walking was a pleasure. 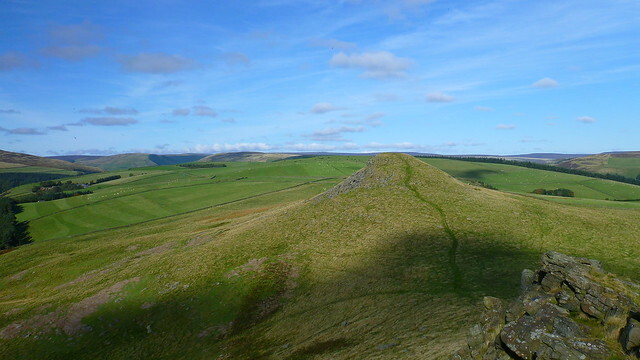 There are a couple of paths that head straight up to the ridge but like my last visit I chose to follow the path that runs across the bottom edge (a little soggy but passable) to the far end of the ridge coming down from Fan Frynych. 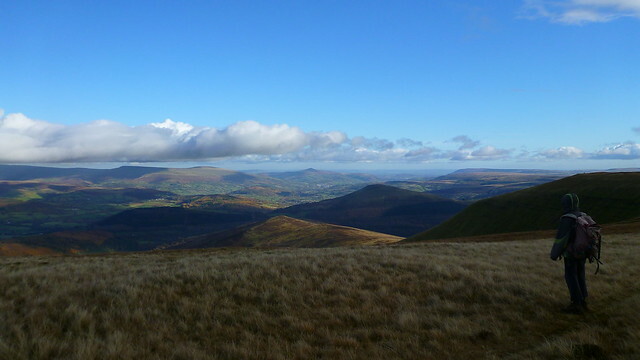 This gives great views up into the dark recesses of the crags, back across to Pen-y-Fan and Corn Du and down over the Usk valley to Brecon and the Black Mountains beyond. 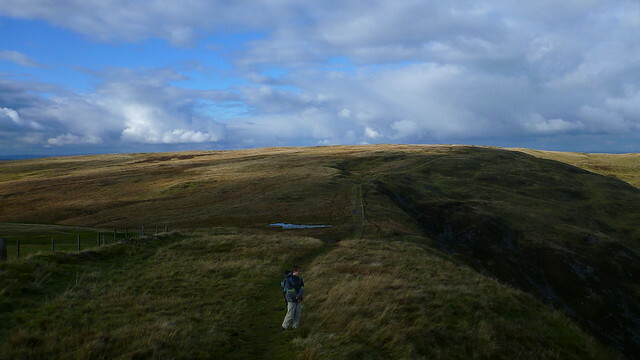 Once on the ridge it’s a broad easy path up onto the broad plateau of Fan Frynych. 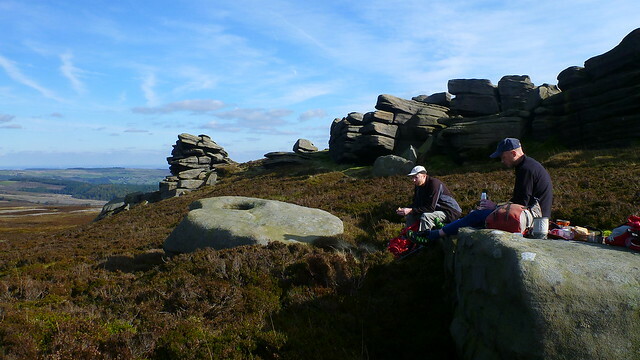 We took advantage of a spell of sunshine to have lunch and a cuppa amongst the hollows created when stone was quarried from up here. 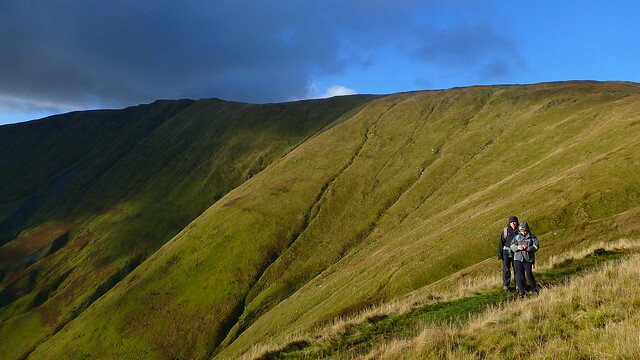 From there it’s an easy stroll along the edge of the cwm towards what passes for the summit. The views across the Fforest Fawr and the Brecons were amazing, the dark clouds adding a sense of moody magnificence to the scene. 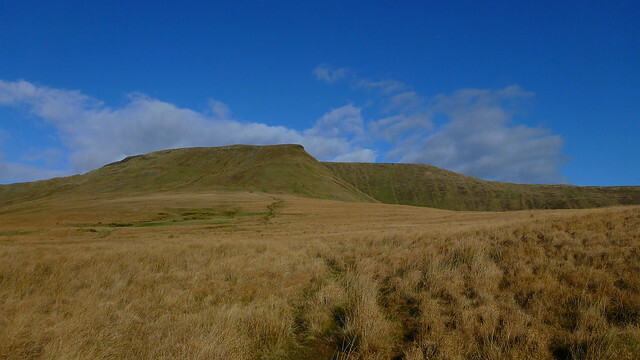 I looked across to the much higher bulk of Fan Fawr that I’d climbed the previous visit and wished I was carrying on – it’s a pleasant high-level grassy stroll. 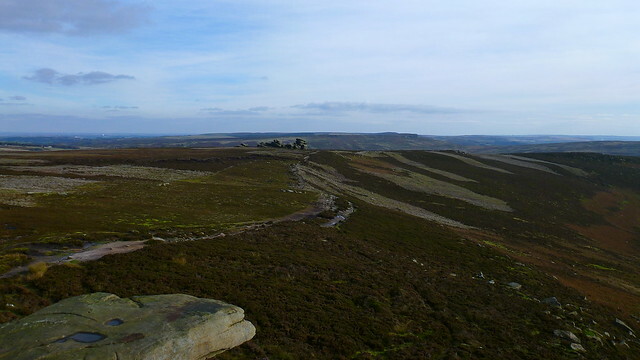 As you start to head down the path hugs tight to the cliff edges giving some eagle eye views into the dark corrie below. 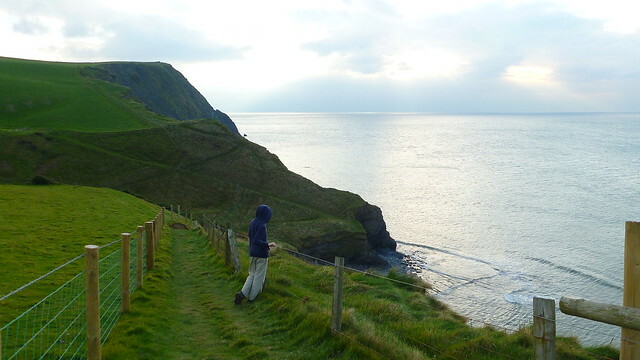 We kept looking for the Peregrines or other birds of prey swooping and hunting amongst the cliffs but with no luck. TBF being the wonderful warm hearted soul that she is lets me go out to play once a year to watch the football. I meet up with Uncle Fester and Geordie Munro for a day out that includes a nice fried breakfast, a game of footy at MCFC, a few beers in some of the old pubs we used to frequent and a fine curry in one of the many fine establishments that Manchester has to offer. City duly obliged in making the day complete with a 3-0 victory over Sunderland. The weather forecast the following day promised warm sunshine and extensive blue sky, enough to convince even the reticent UF into a day’s walk. 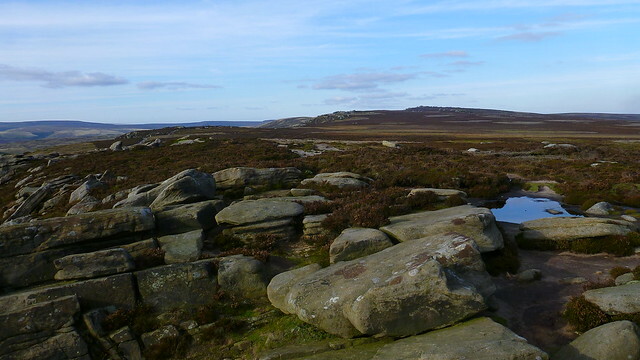 Both me and GM were keen for some proper Bleaklow bogtrotting but UF was less than enthusiastic so we compromised on the Derwent Edges around the reservoirs, a more than adequate, in fact a mighty fine, substitute. 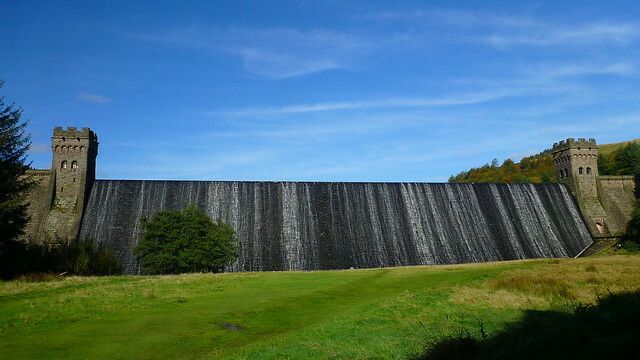 On such a fine day the Derwent Reservoirs are a busy place but for some inexplicable reason we thought we might find a space at the Fairholmes car park. Fat chance. We had to park near the Yorkshire Bridge and amend our plan somewhat. UF suggested we take in the small hills just to the west of bridge as a better route to Fairholmes. He was right. 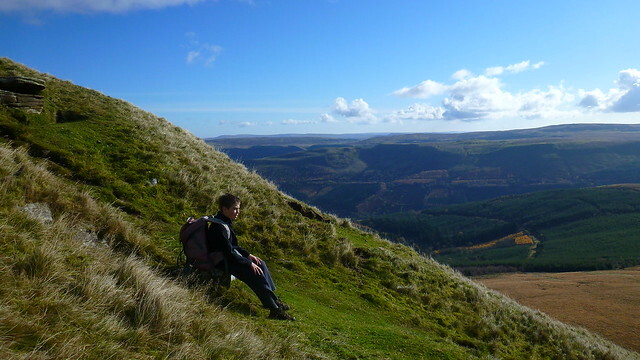 I’d never heard of these hills before let alone walked them despite having lived in the area for a few years. 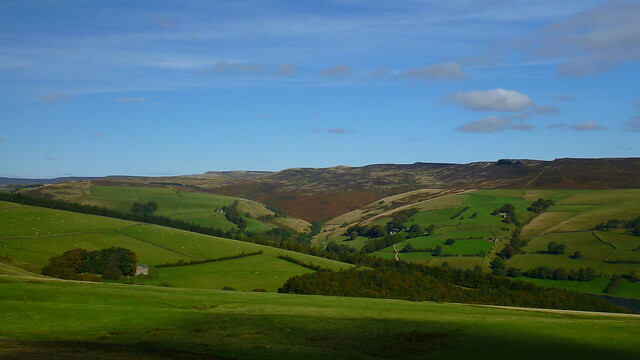 The twin peaks of Crook Hill have quite a rocky summit, like mini versions of the grander Win Hill across the valley and the morning views across Kinder, Bleaklow, the Derwent Edges across the reservoir and particularly the Edale valley were superb. Better than that they seem little known and we had the whole place to ourselves with not a soul in sight in contrast to the busier lake-shore. 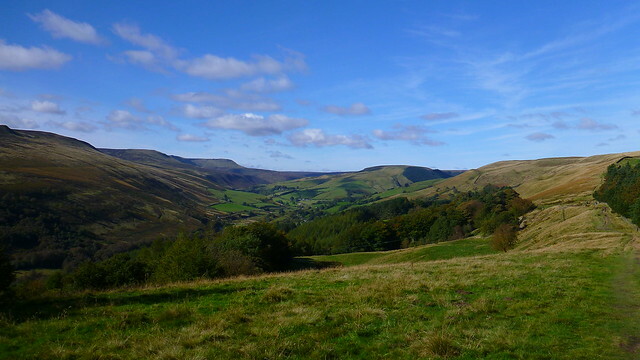 From the tops it was an extremely pleasant stroll over high grassy meadows of Bridge End Pasture in the warm sunshine back towards Fairholmes. 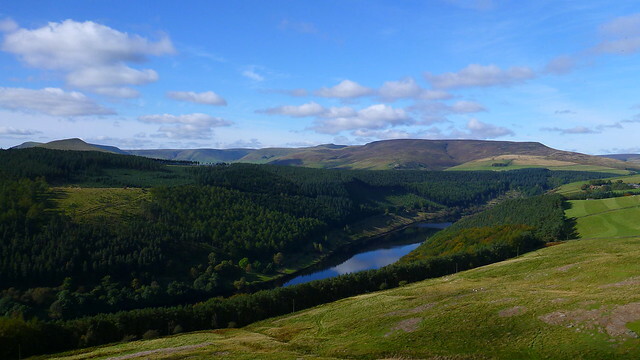 As we dropped down towards the car park we started to see more of said crowds but the views were still superb especially down by the Ladybower Reservoir and the crowds didn’t really seem to matter. 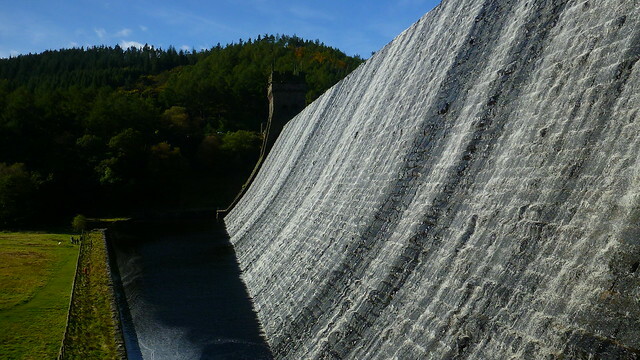 We breezed quickly past the car park and onto the Upper Derwent Reservoir Dam which had water flowing over it. Quite a becoming sight and something the kids would have enjoyed for sure. 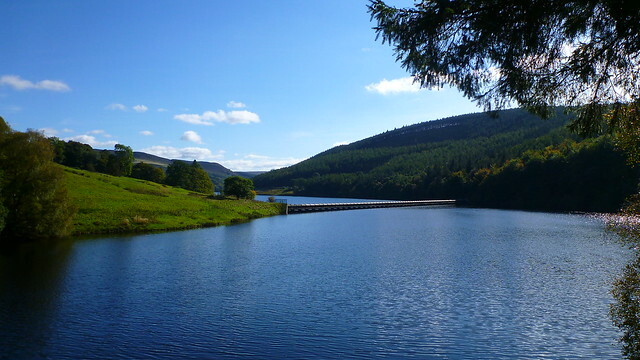 As we pressed on past the dam along the reservoir we started to lose the crowds and peace returned. 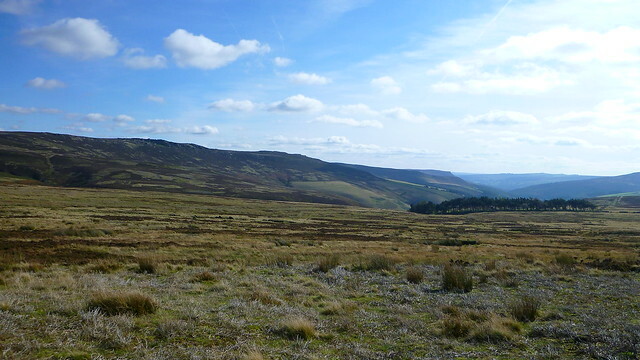 Our original plan was to use Abbey Clough as a means to reach the open moorland. 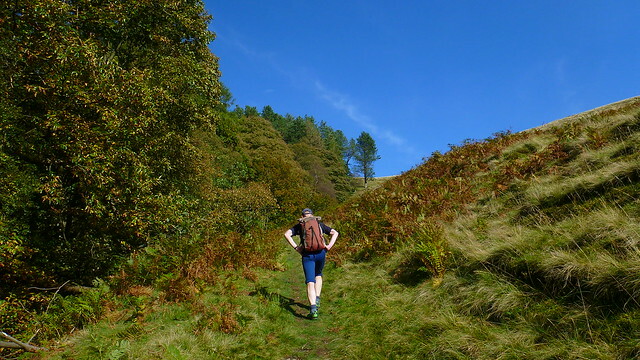 Our faffing about earlier had reduced the time available so we struck up an access path along Hollin Clough to reach the objective in a shorter albeit much steeper way. 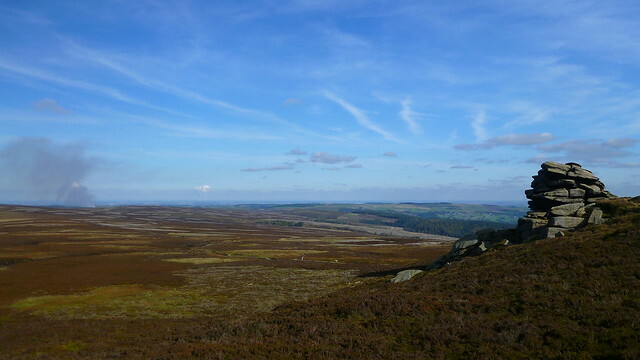 Once out on the moor the views were again expansive especially north towards the vast expanses of the open moorland that extend around the Derwent watershed to Bleaklow. GM and UF, fine figures of men? 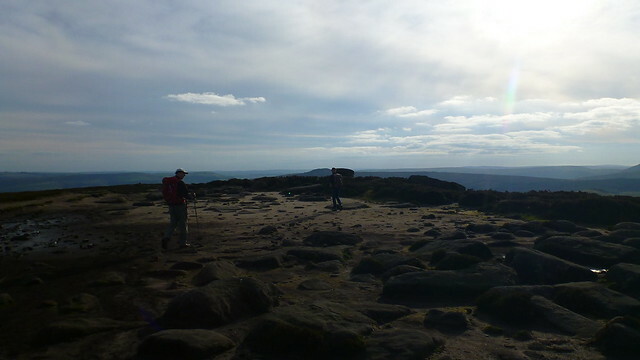 Back Tor is a fine place and we found a nice collection of rocks in the sun and out of the wind to have lunch. The views were expansive with the Ouse valley and its massive power stations billowing steam visible in the distance. 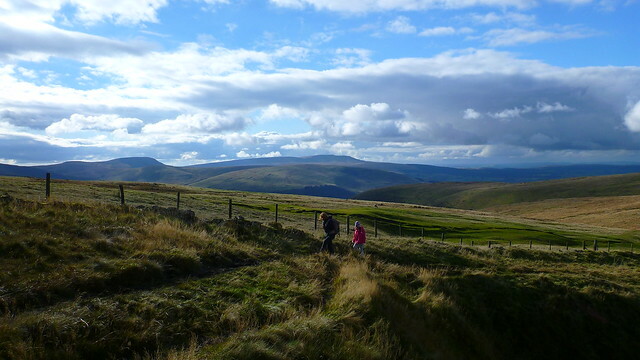 The long stroll along the edges high above the reservoirs was every bit as special as I remembered it. 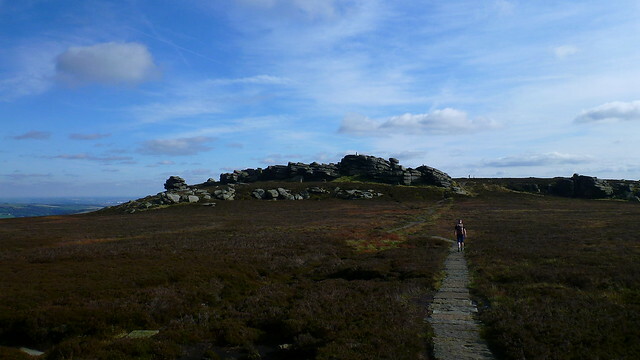 Easy walking, wide views of the Peak and the variety of stone tors along the way. 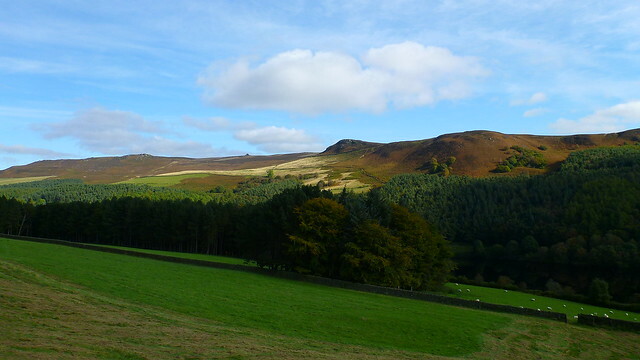 I love the wonderful evocative names of the tors up here. Cakes of Bread, Salt Cellar, Wheel Stones. I seem to remember one was callled the Coach and Horses but its not named on the map so I must be thinking of somewhere else. 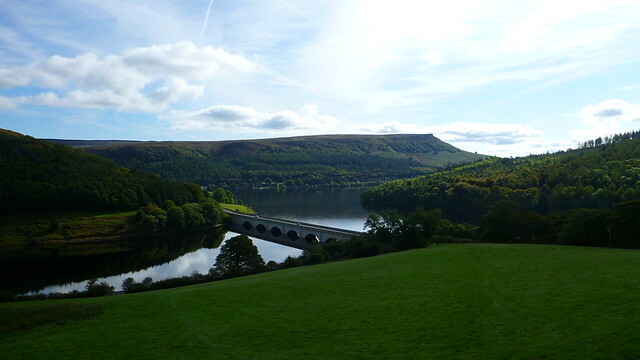 The hills we’d walked on the morning looked particularly fine across Ladybower, reinforcing the feeling I’d missed something by not climbing them before, tempered by the fact it’s always nice to discover something new. Our own plan was to leave the edge at Whinstone Lee Tor and wander back through the trees to the bridge. 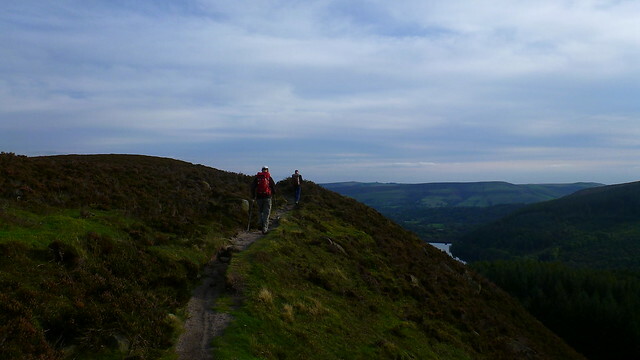 The walking was so good and the edge so fine that we decided to carry on along the edge of Lead Hill and around to Ladybower Tor and hope we could find a way down without hitting the dark forest. 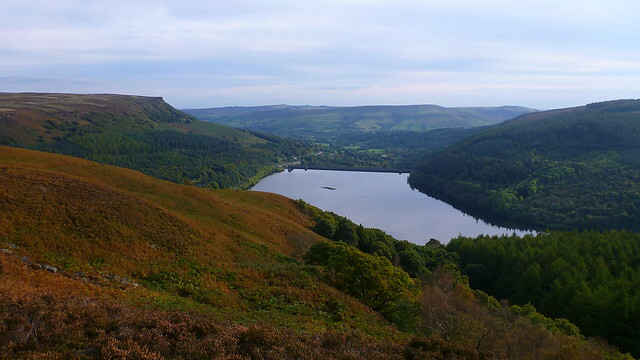 We found an avenue through the deep bracken overlooking Bamford Edge and the bottom end of the Ladybower Reservoir before a short slog back up the road to the car and the long drive home.